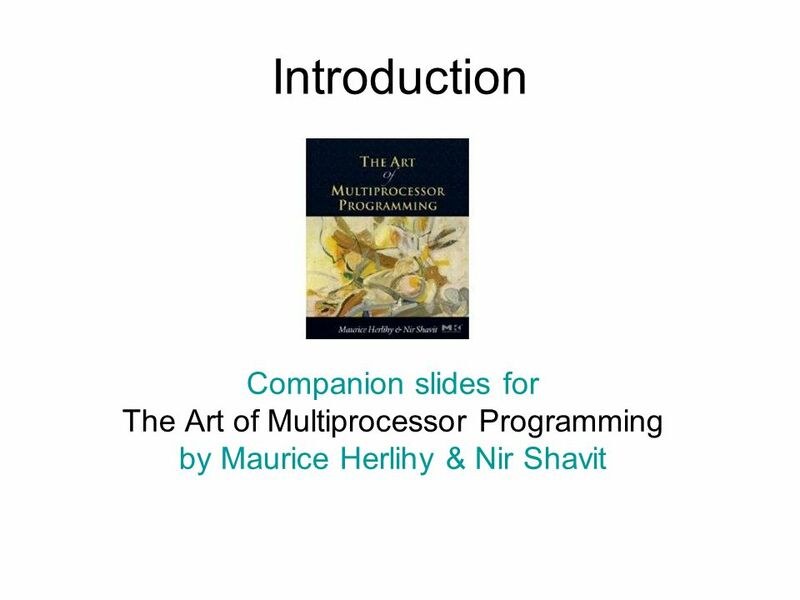 Introduction Companion slides for The Art of Multiprocessor Programming by Maurice Herlihy & Nir Shavit TexPoint fonts used in EMF. 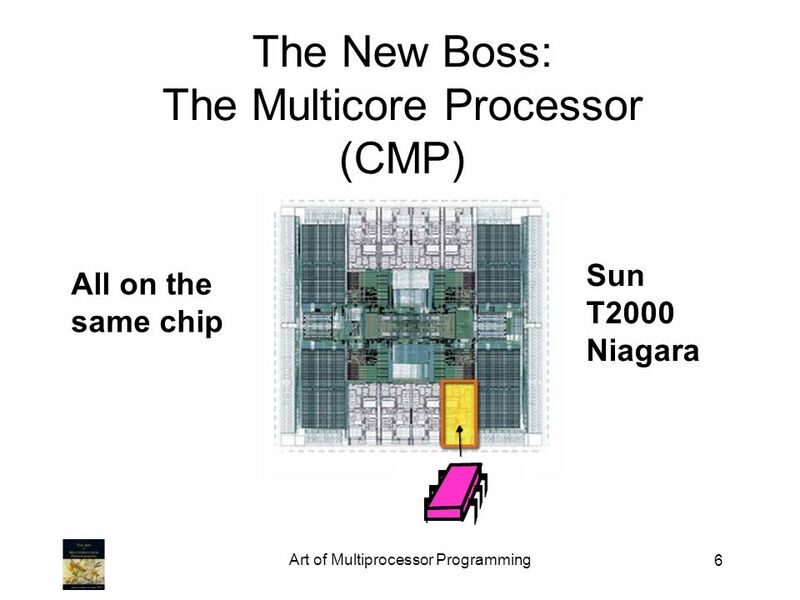 Read the TexPoint manual. 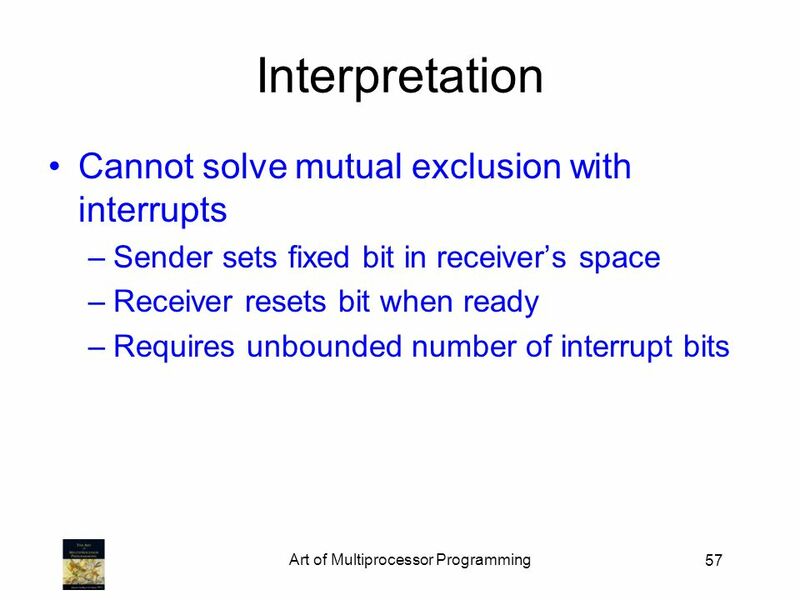 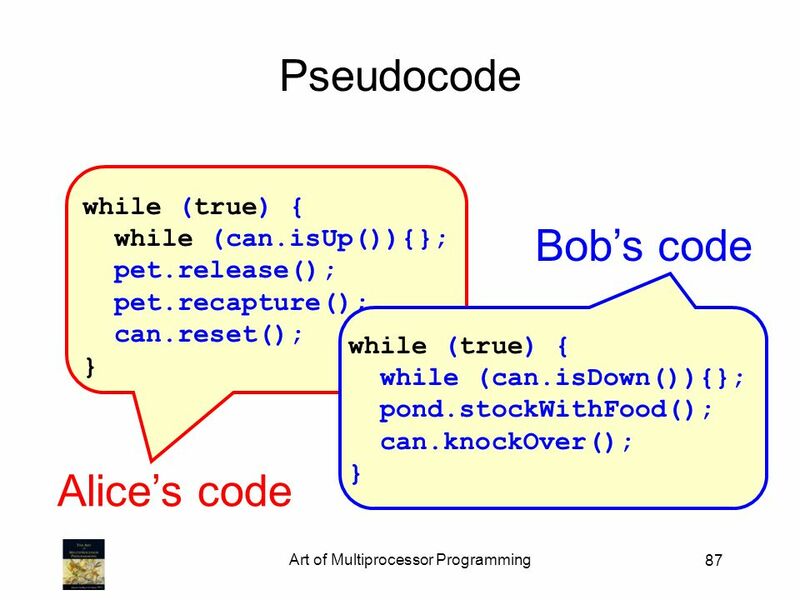 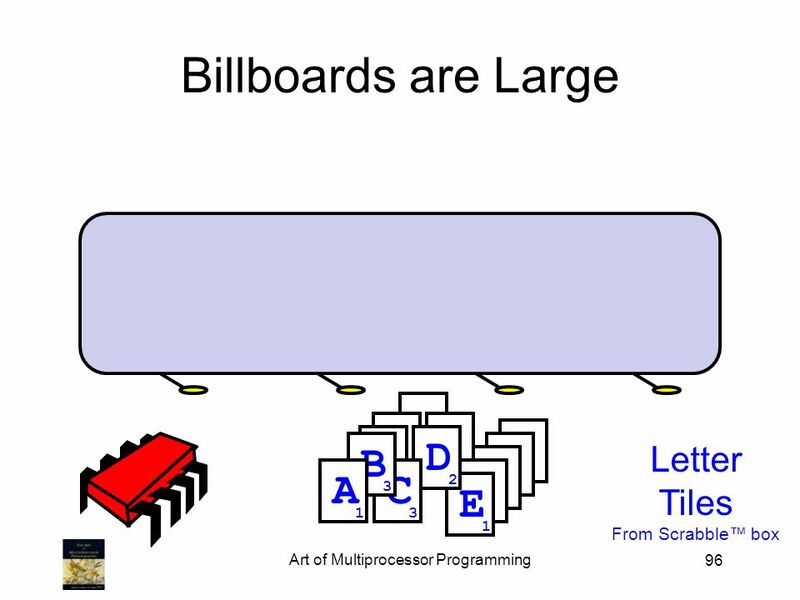 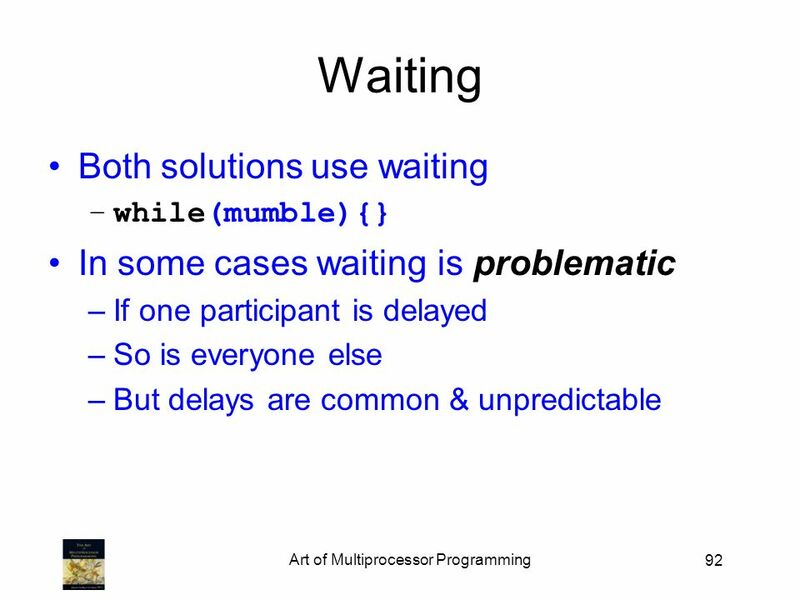 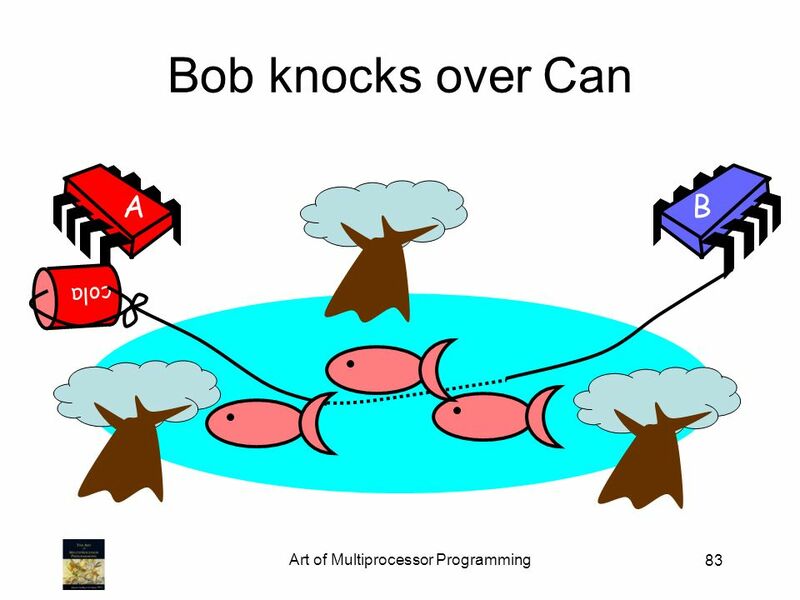 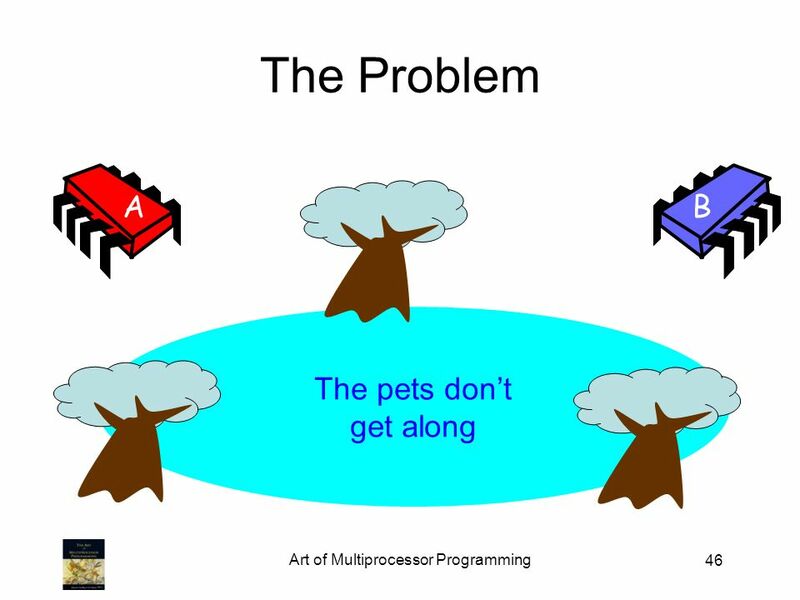 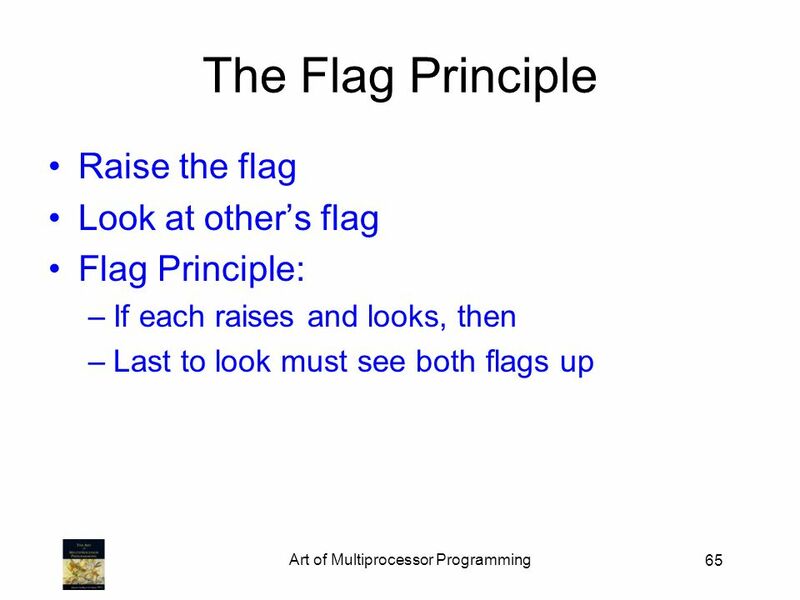 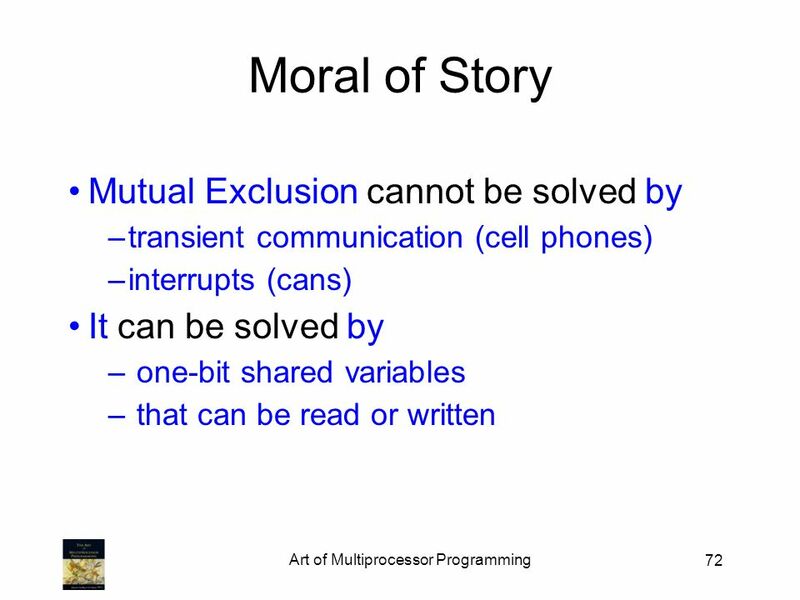 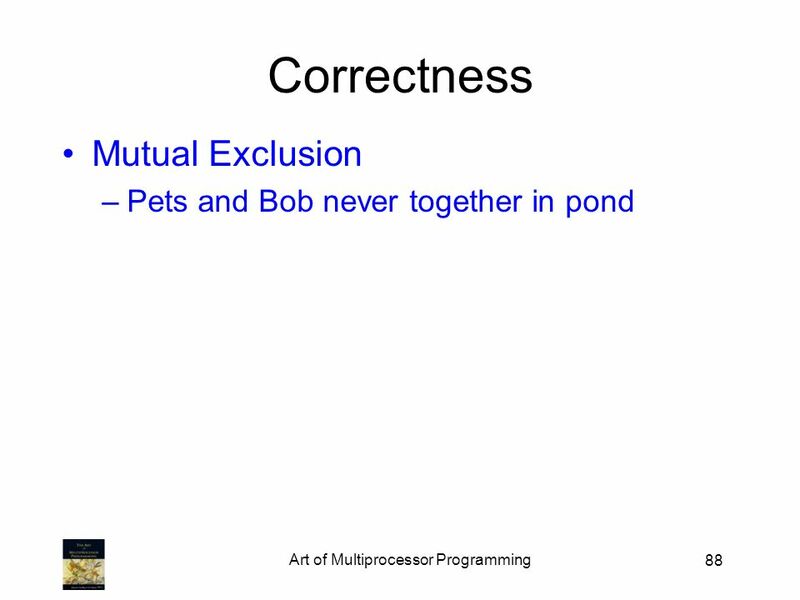 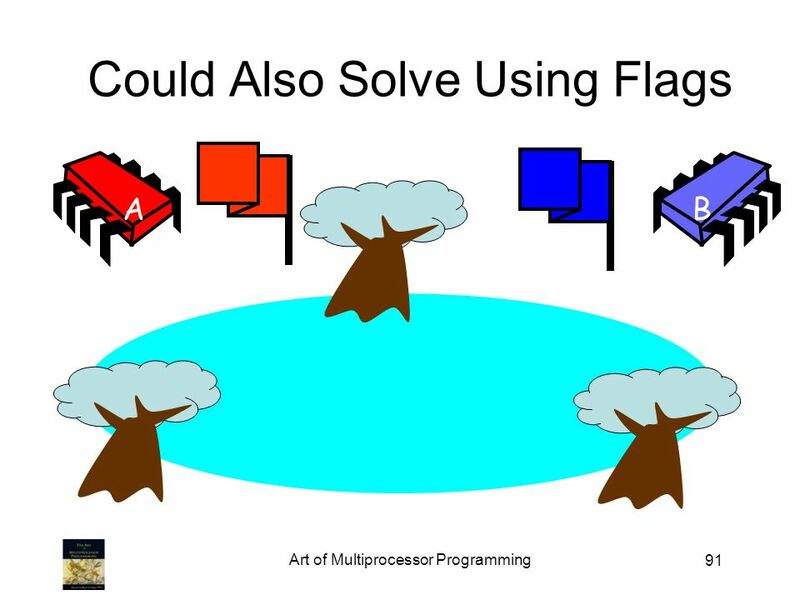 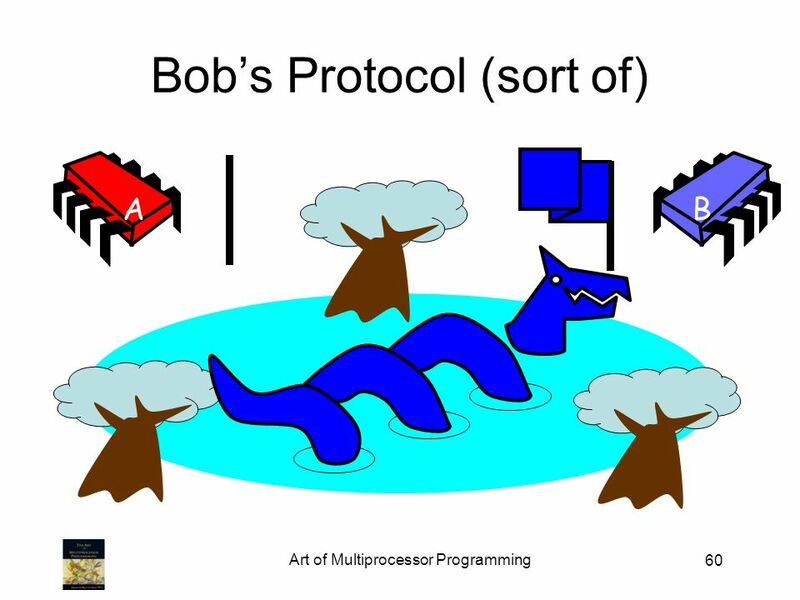 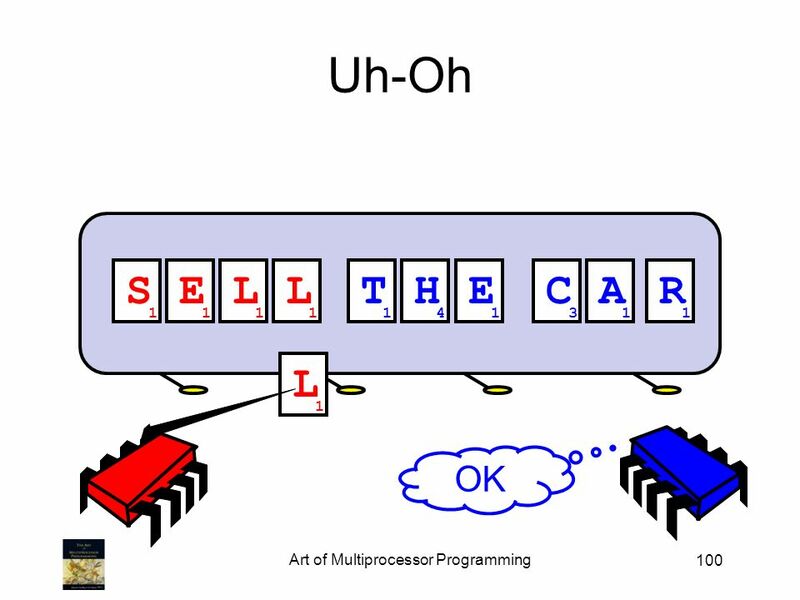 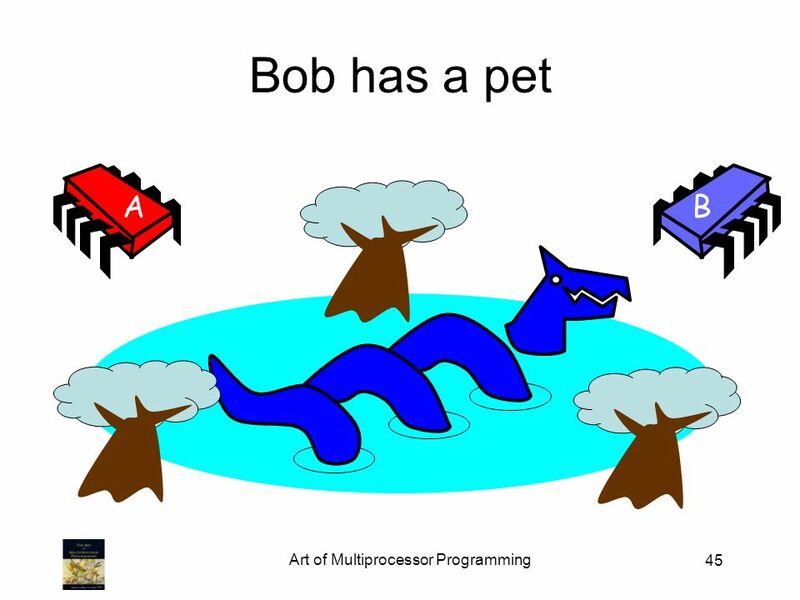 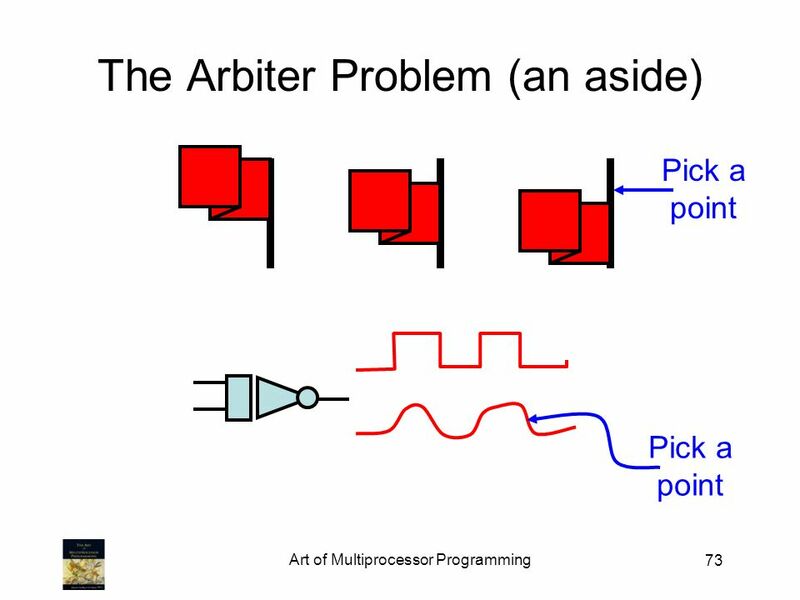 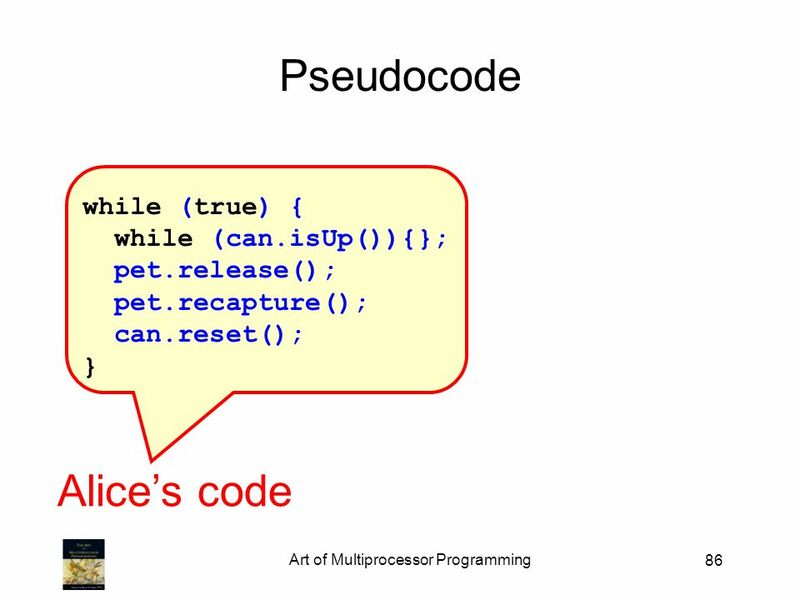 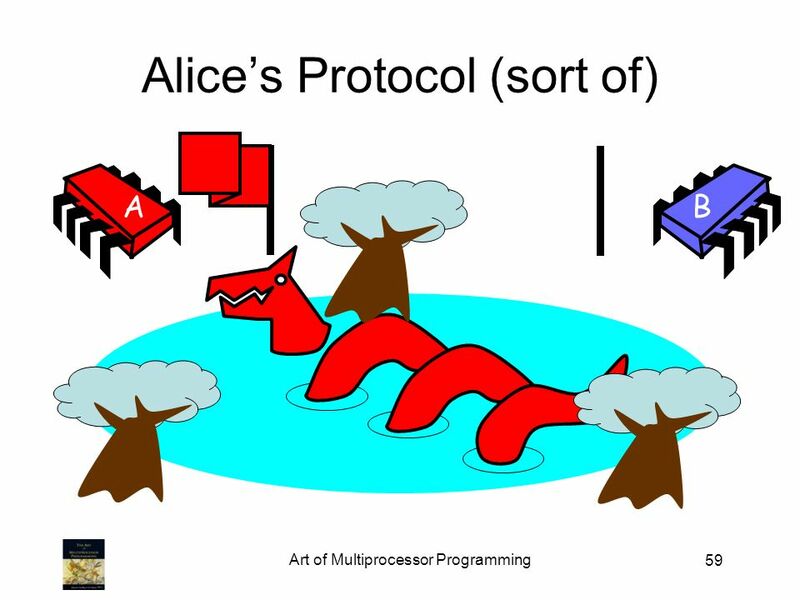 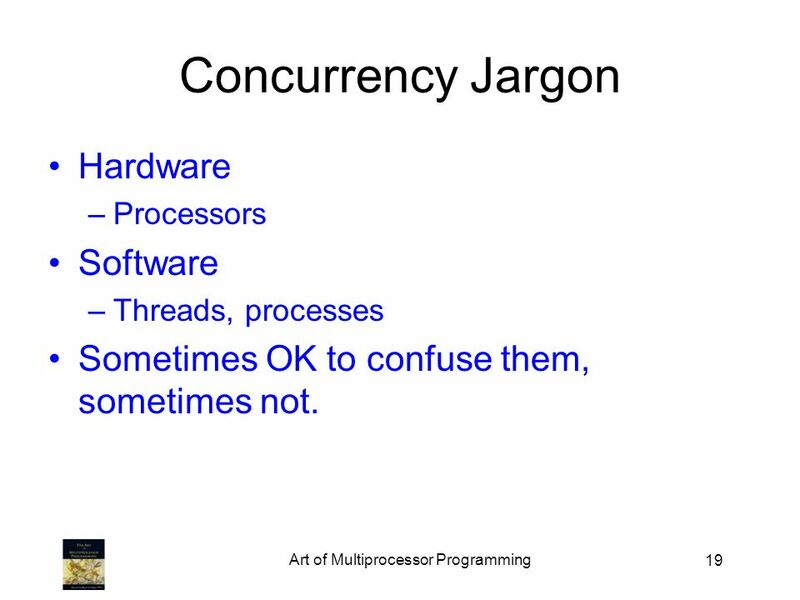 36 Art of Multiprocessor Programming 36 Is this problem inherent? 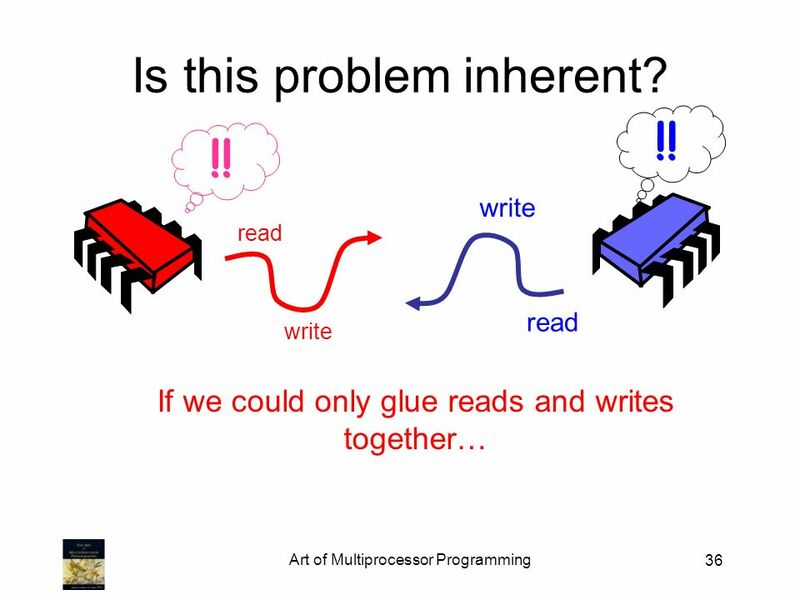 If we could only glue reads and writes together… read write read write !! 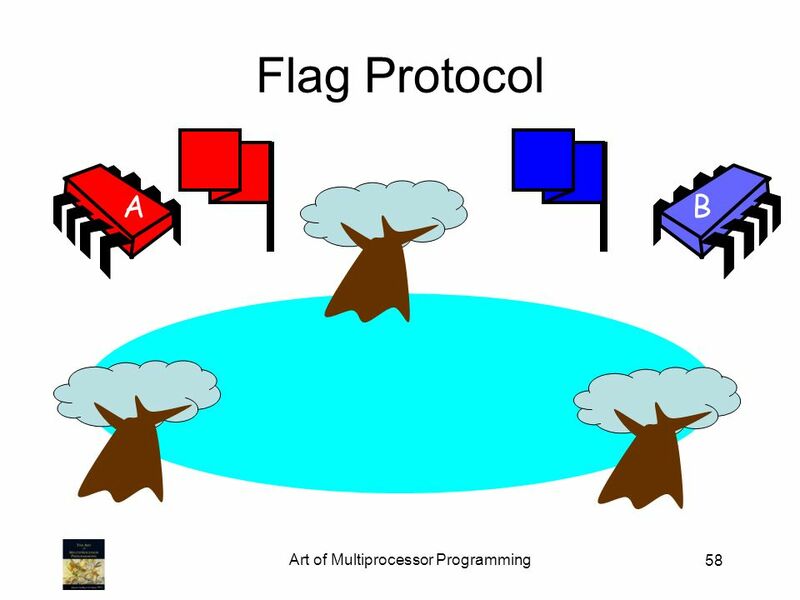 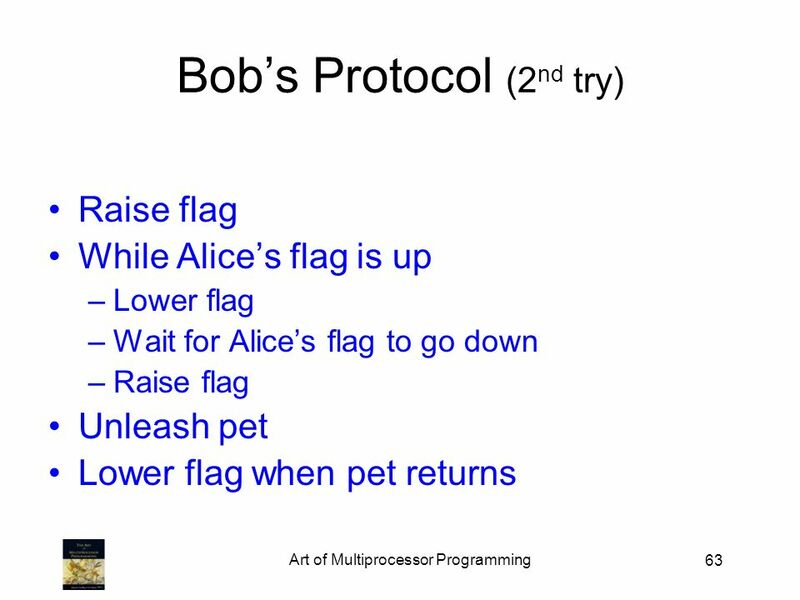 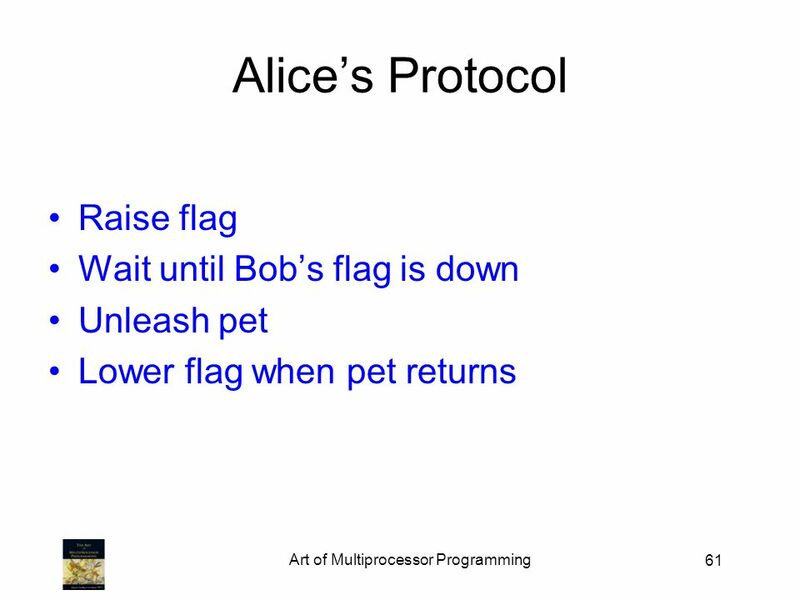 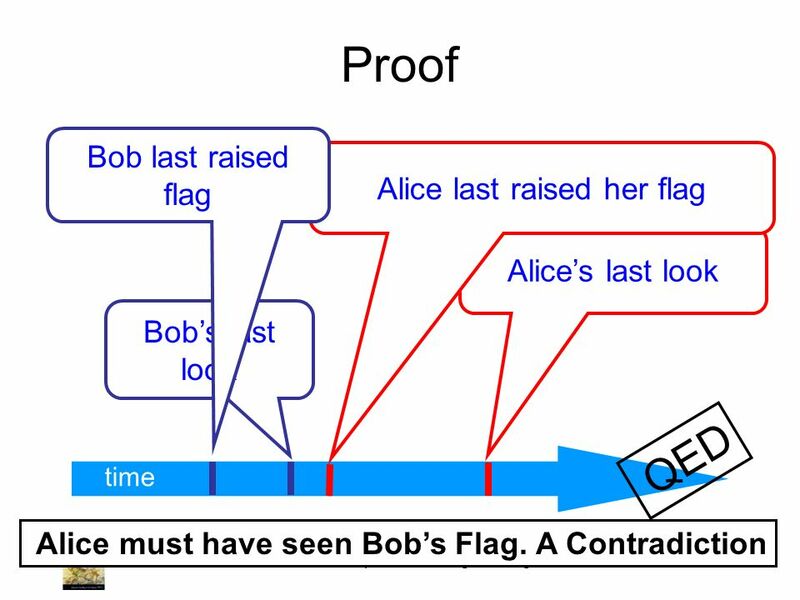 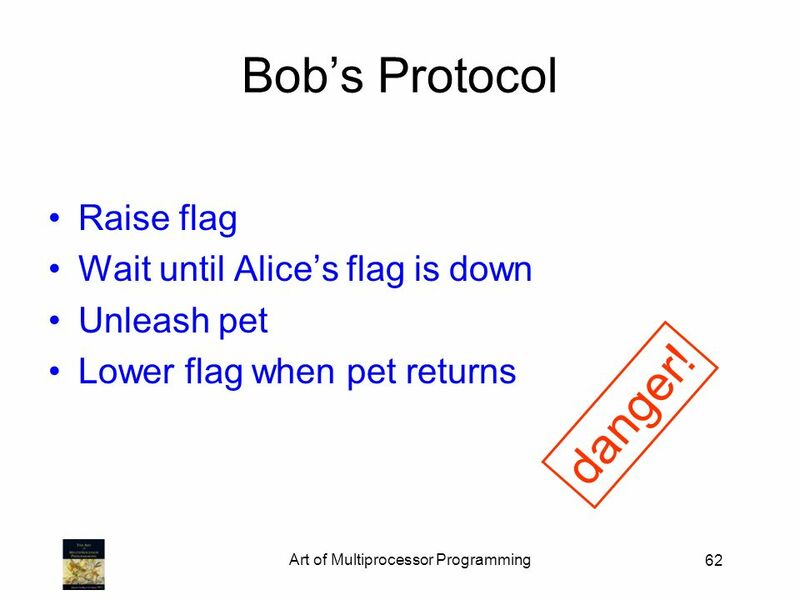 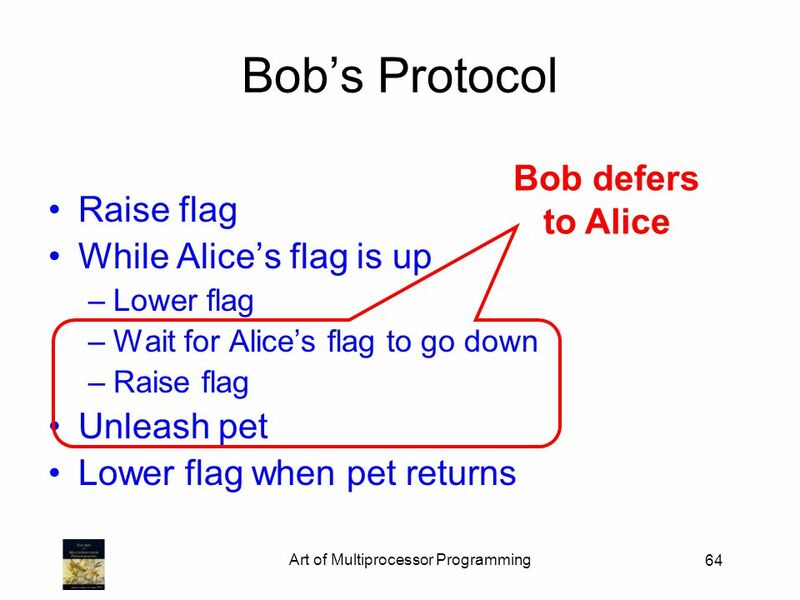 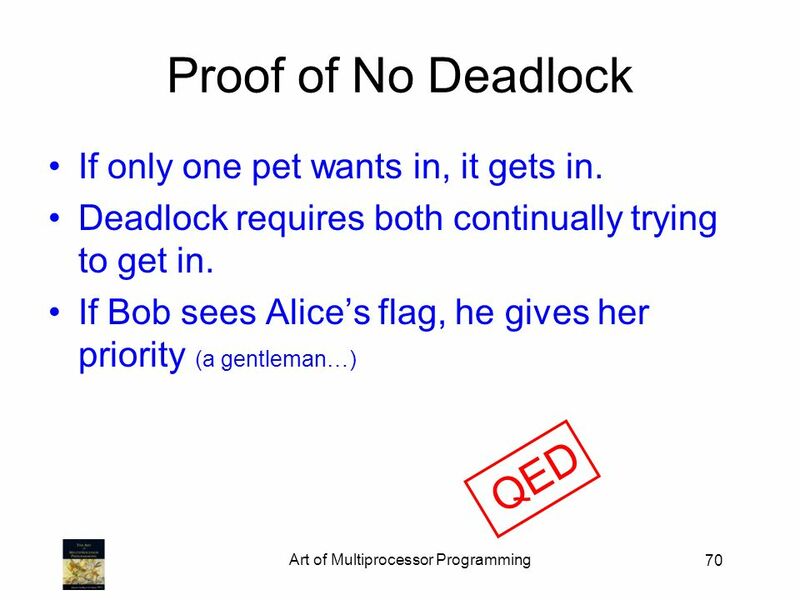 62 62 Bobs Protocol Raise flag Wait until Alices flag is down Unleash pet Lower flag when pet returns danger! 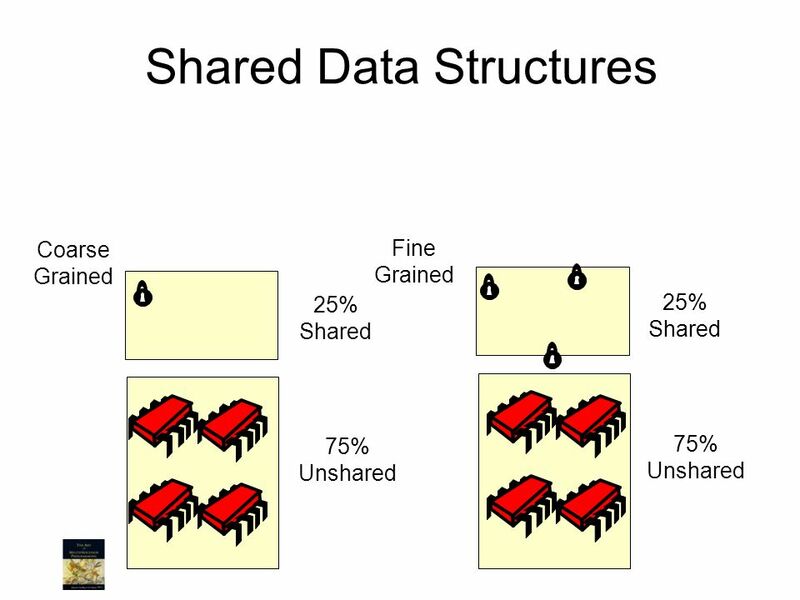 122 Shared Data Structures 75% Unshared 25% Shared Coarse Grained Fine Grained Why only 2.9 speedup 75% Unshared 25% Shared Honk! 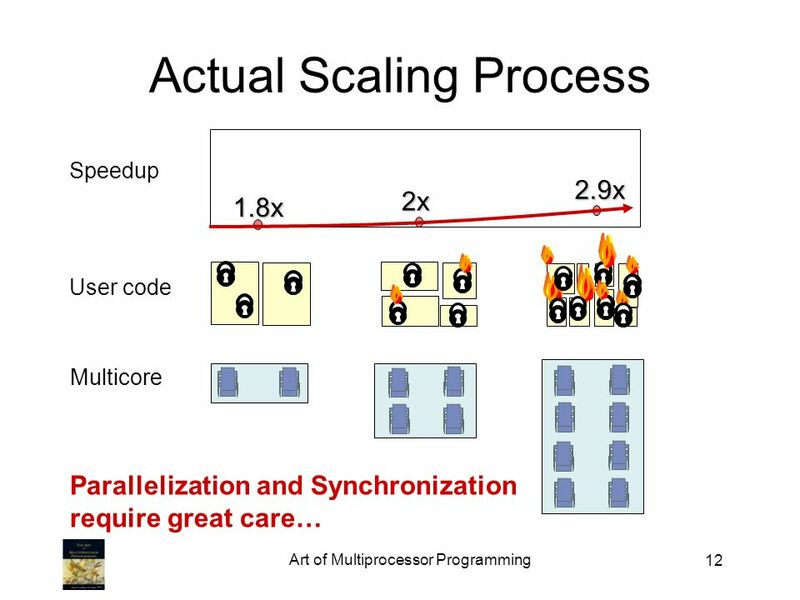 123 Shared Data Structures 75% Unshared 25% Shared Coarse Grained Fine Grained Why fine-grained parallelism maters 75% Unshared 25% Shared Honk! 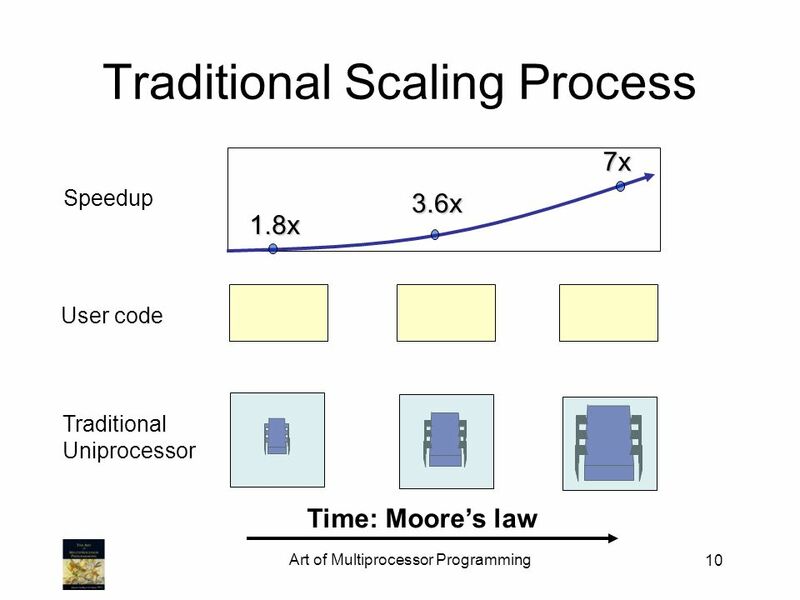 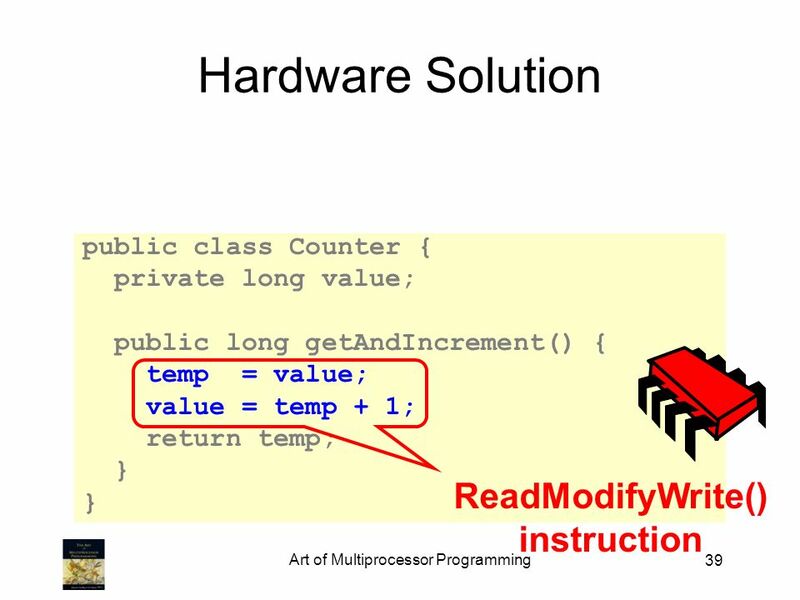 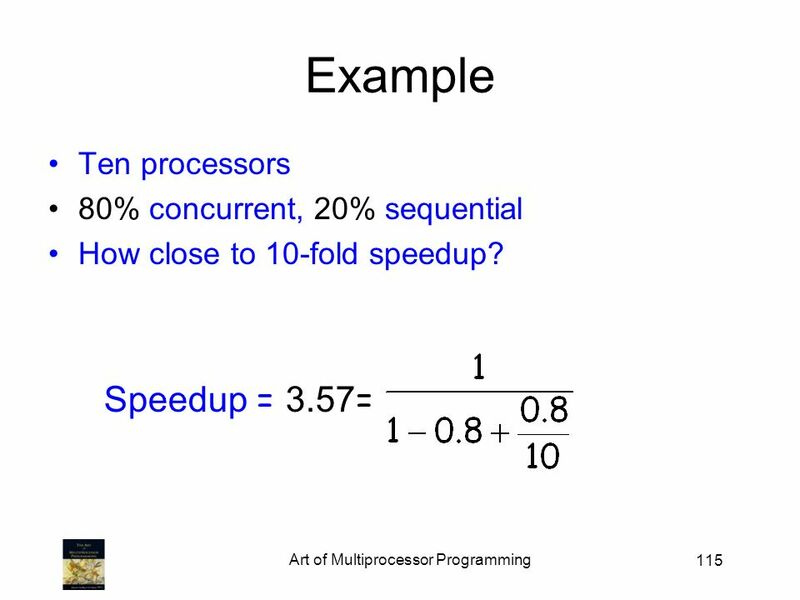 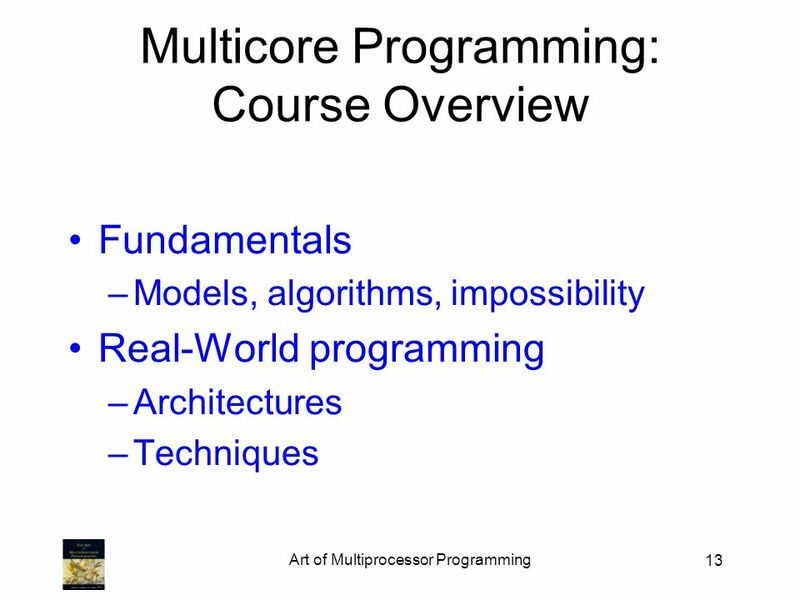 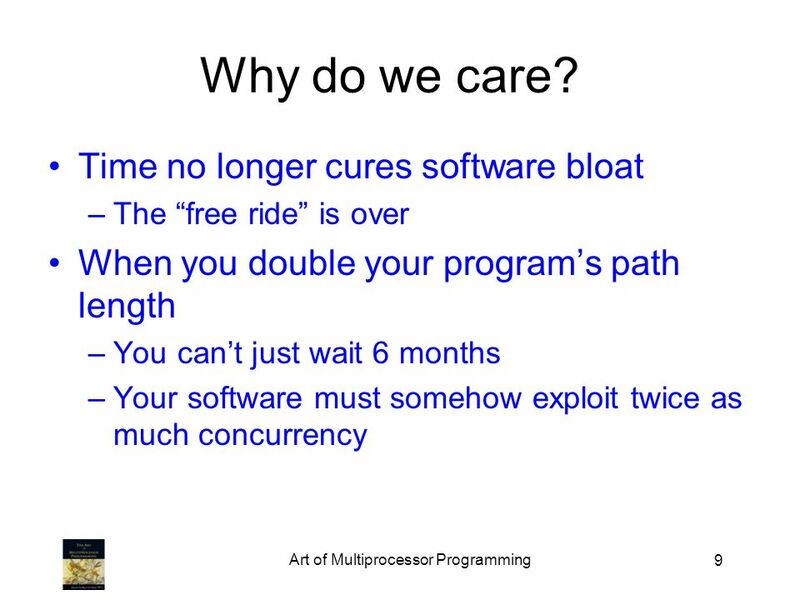 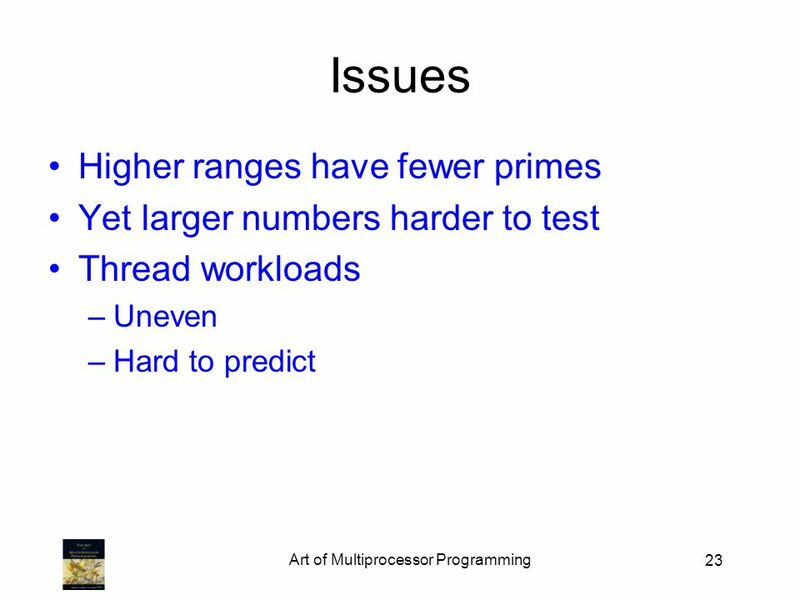 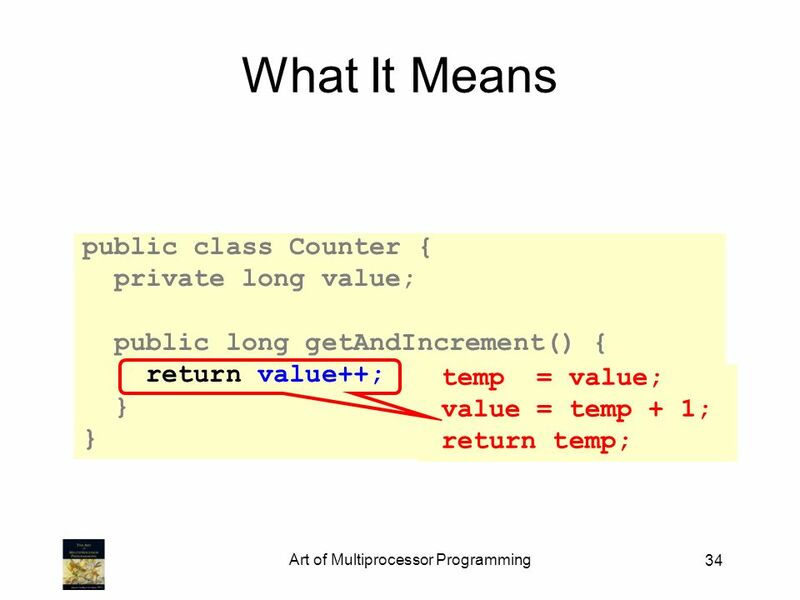 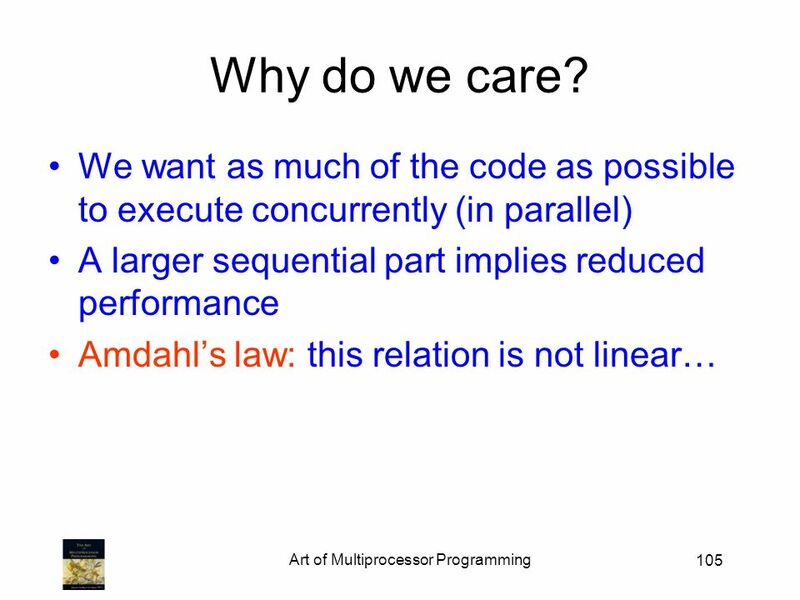 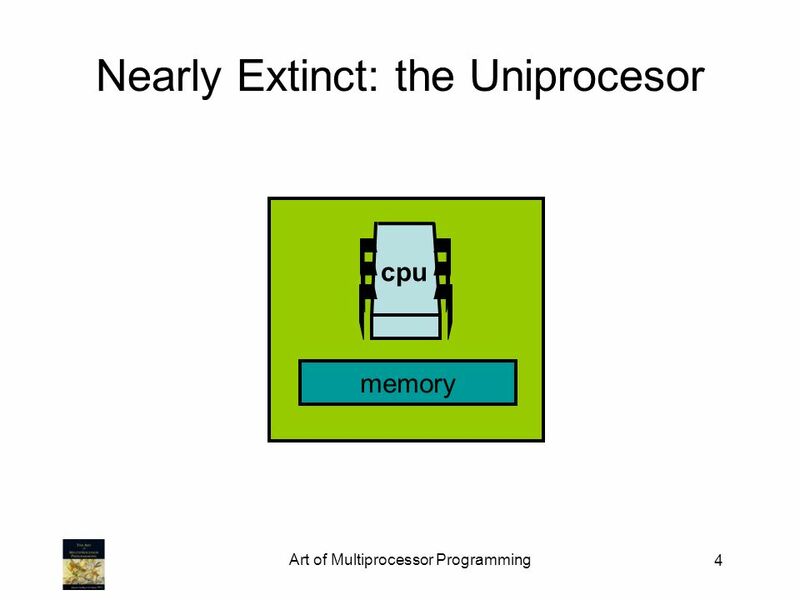 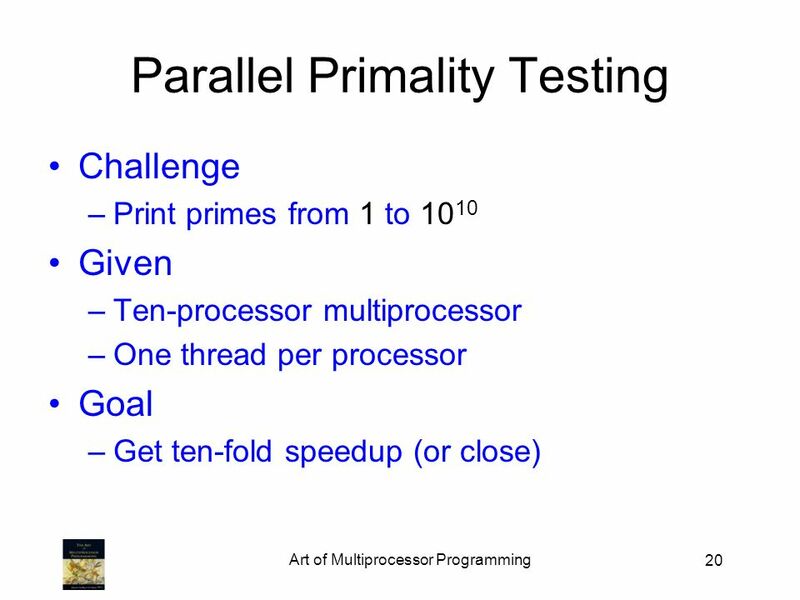 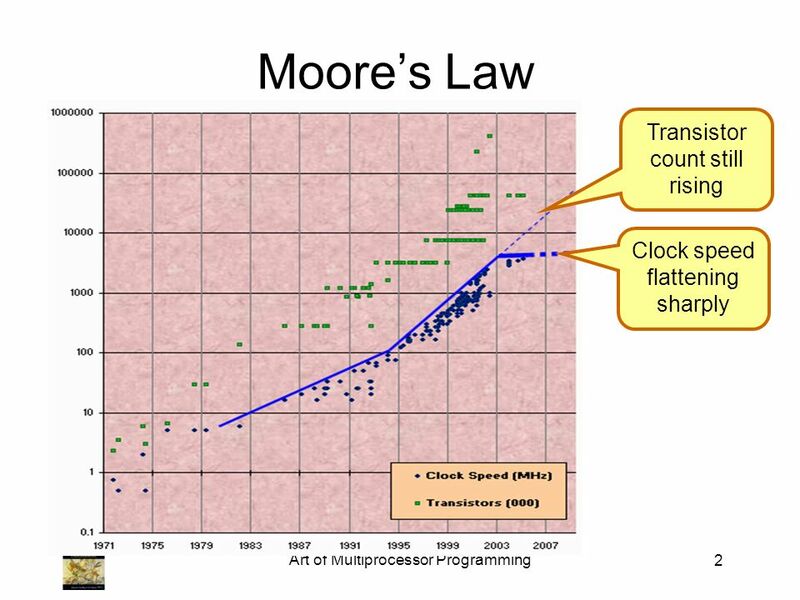 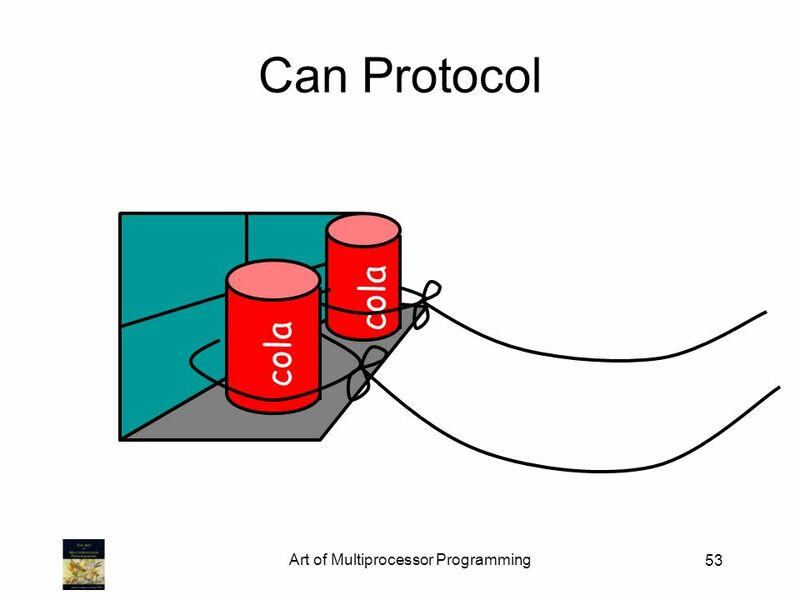 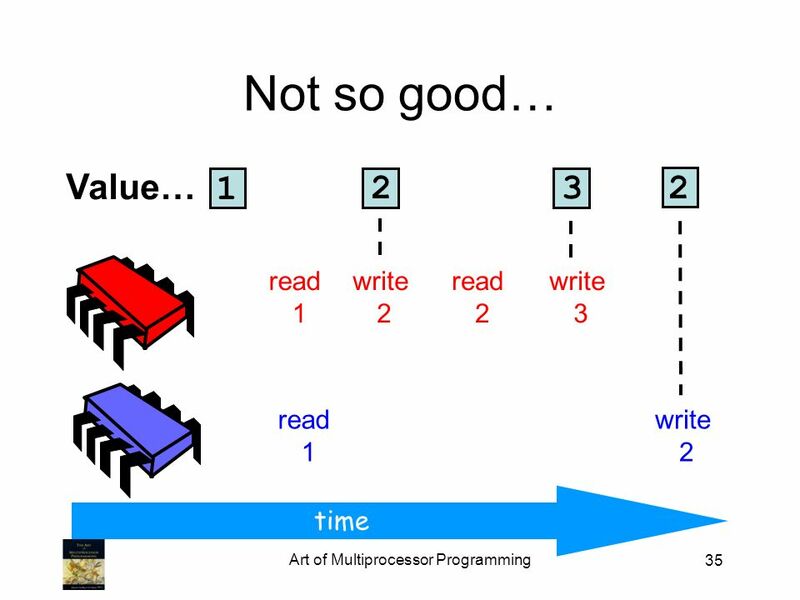 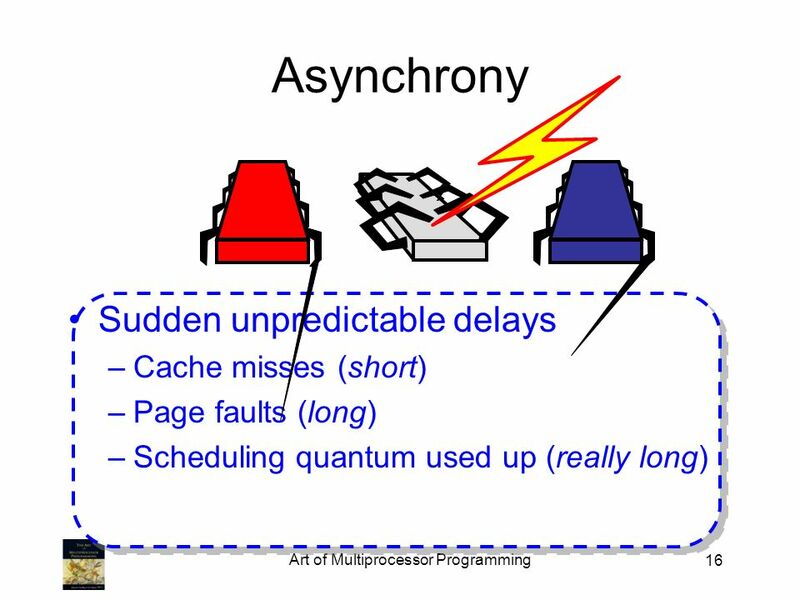 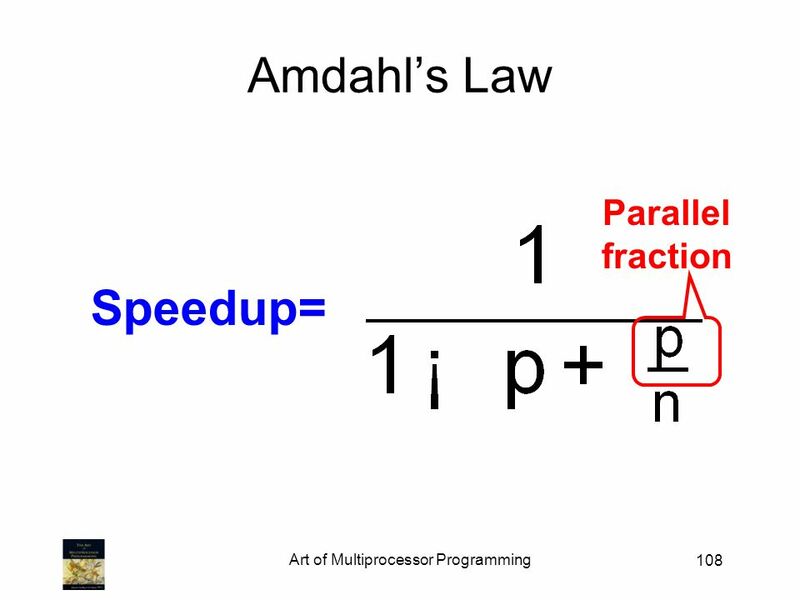 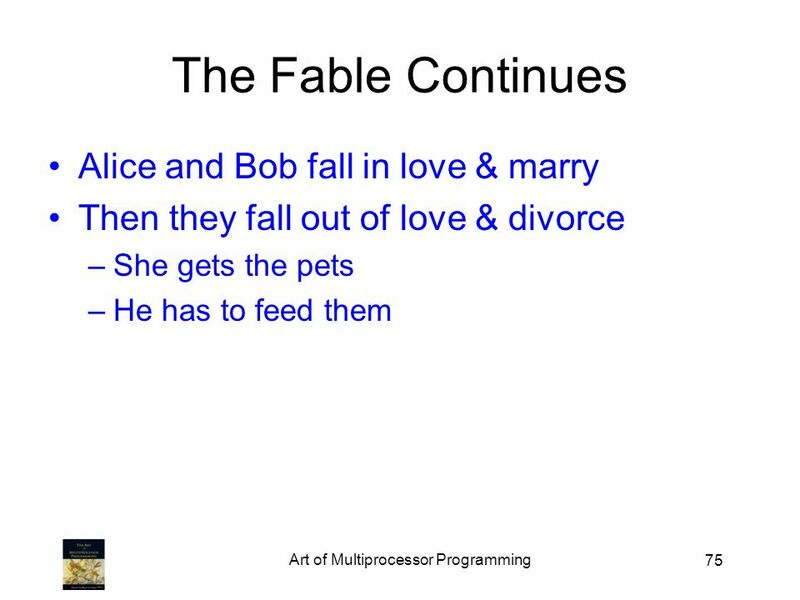 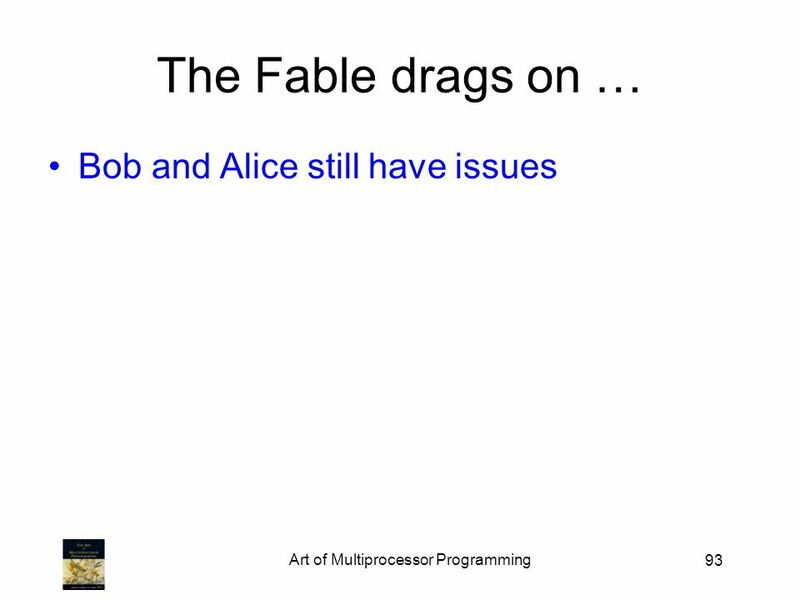 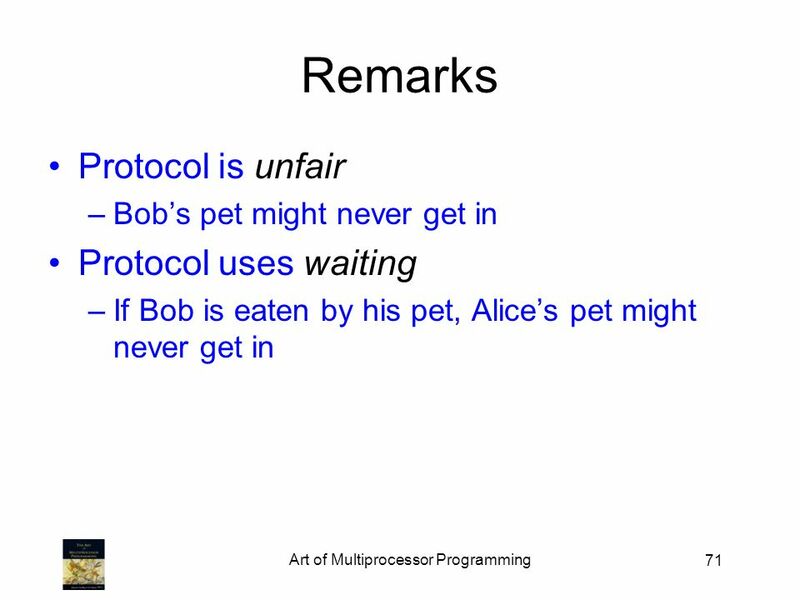 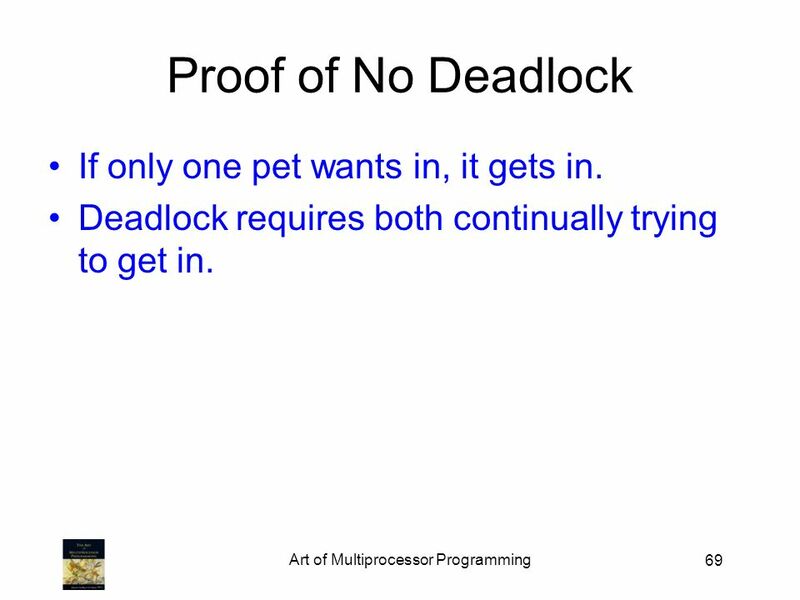 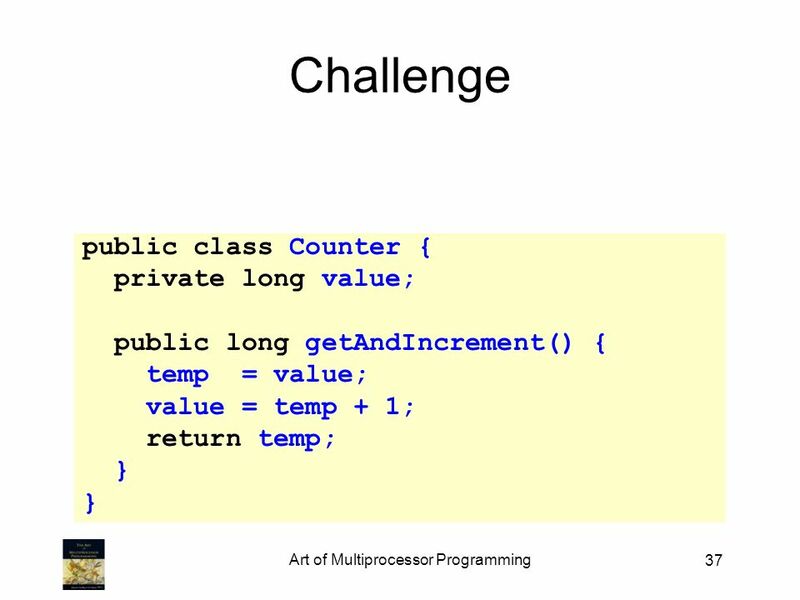 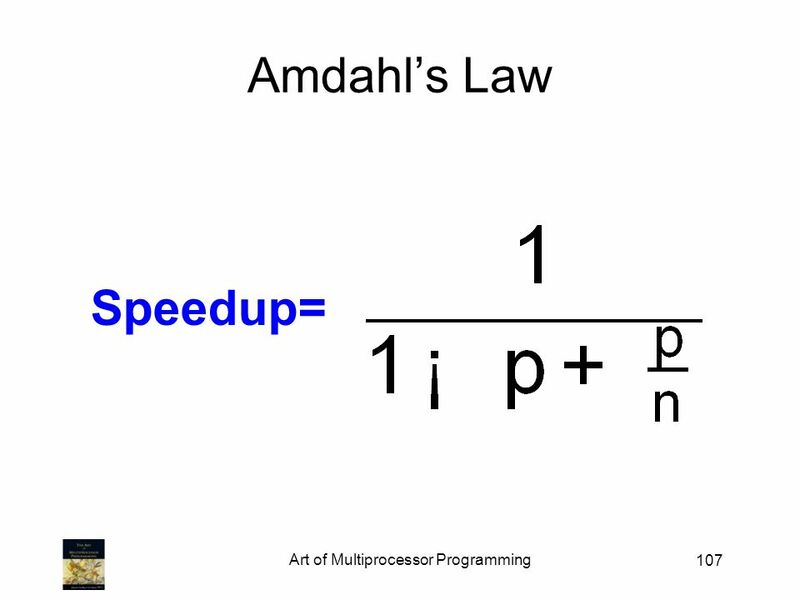 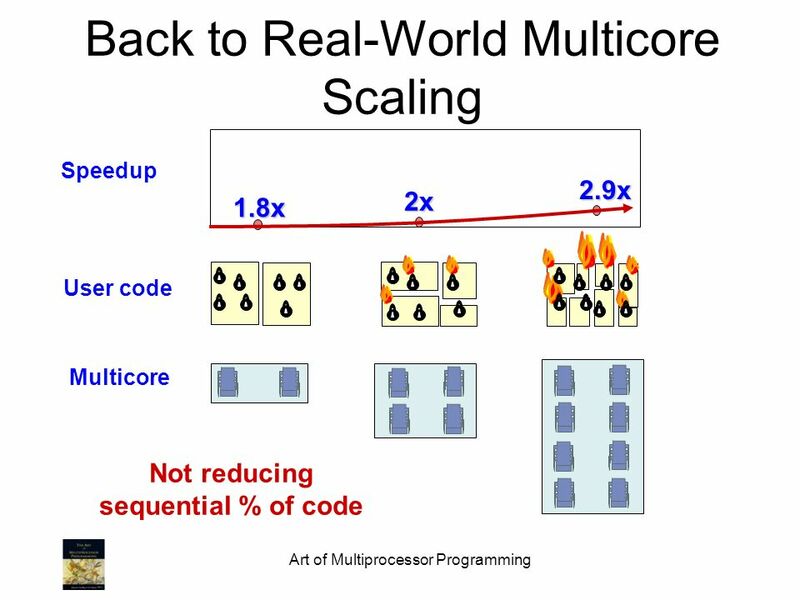 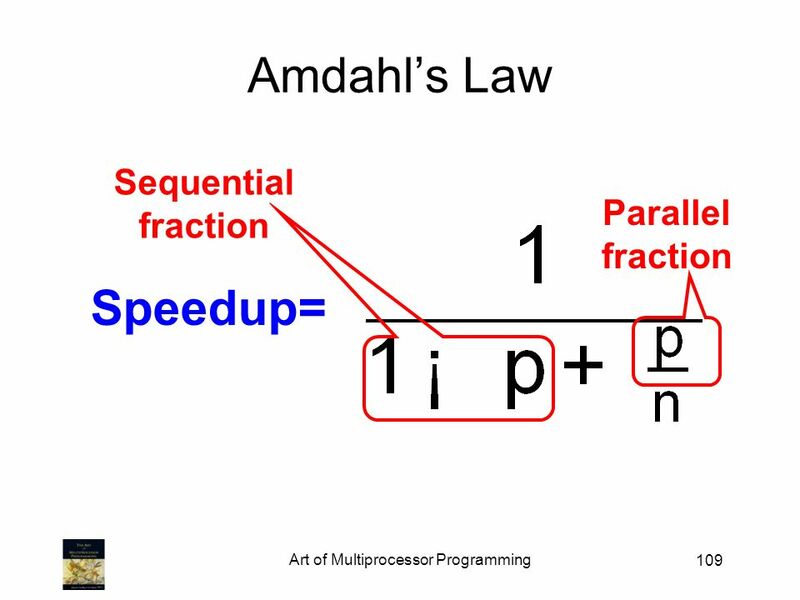 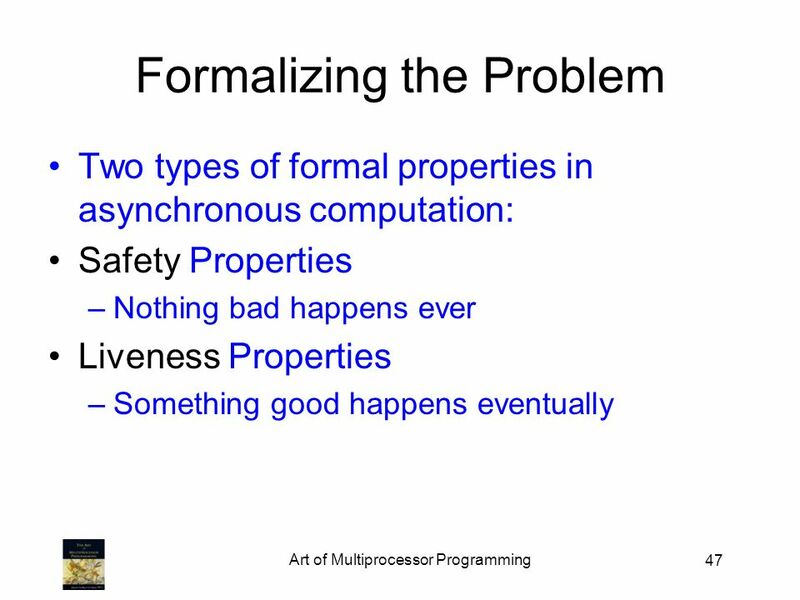 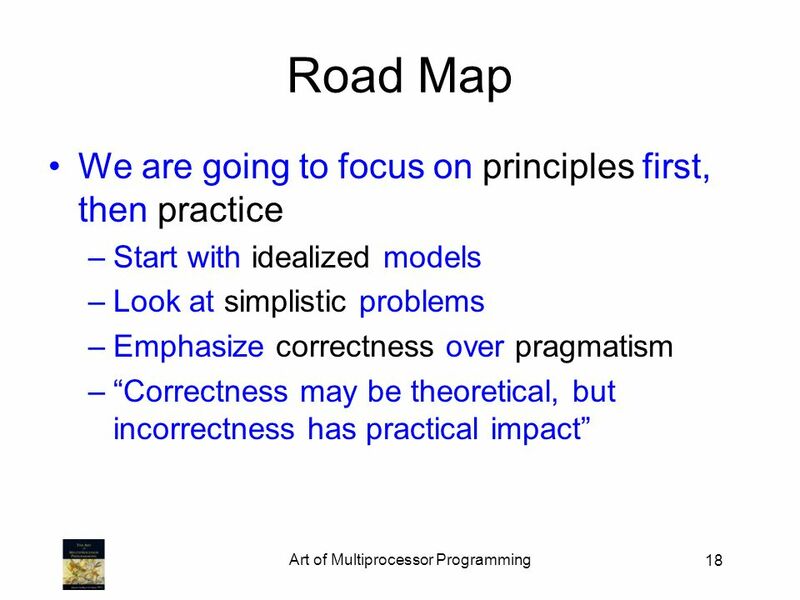 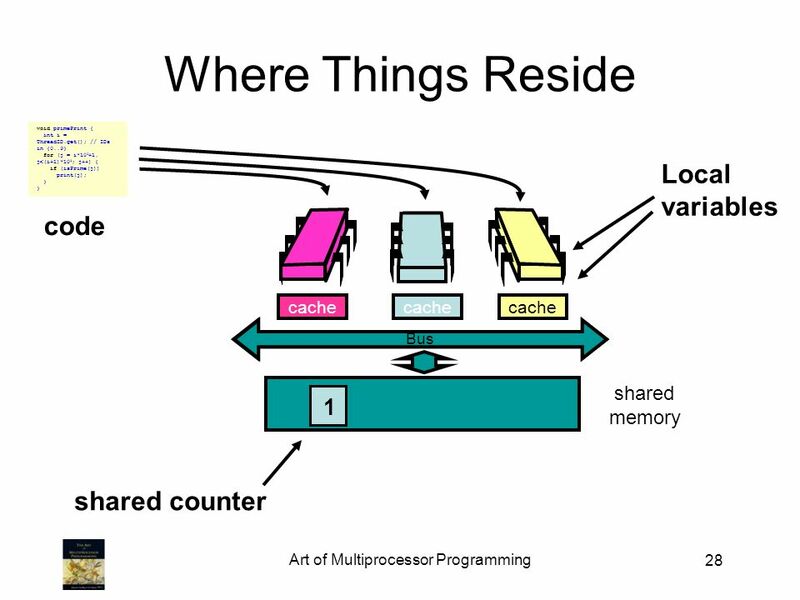 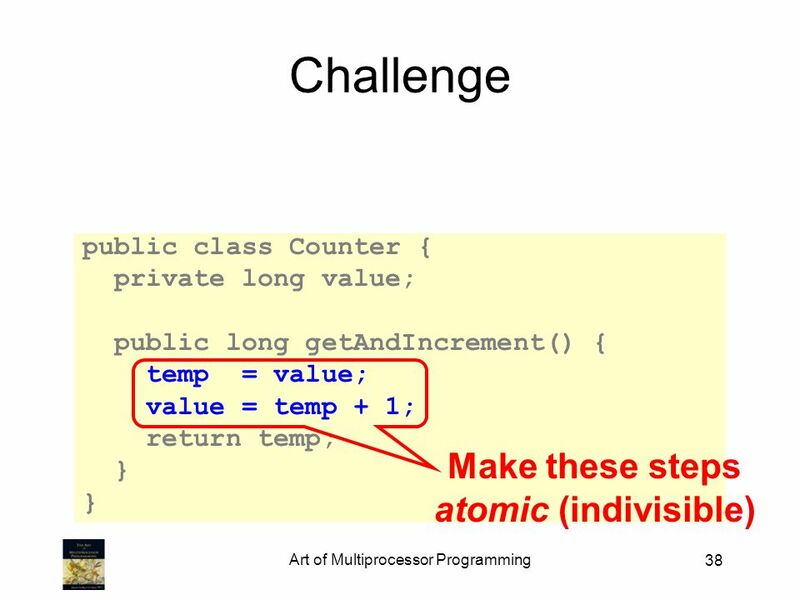 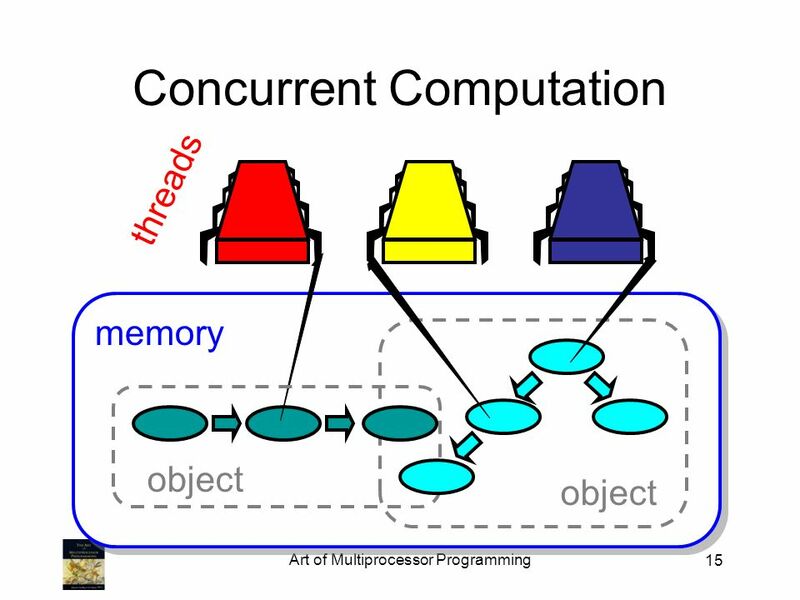 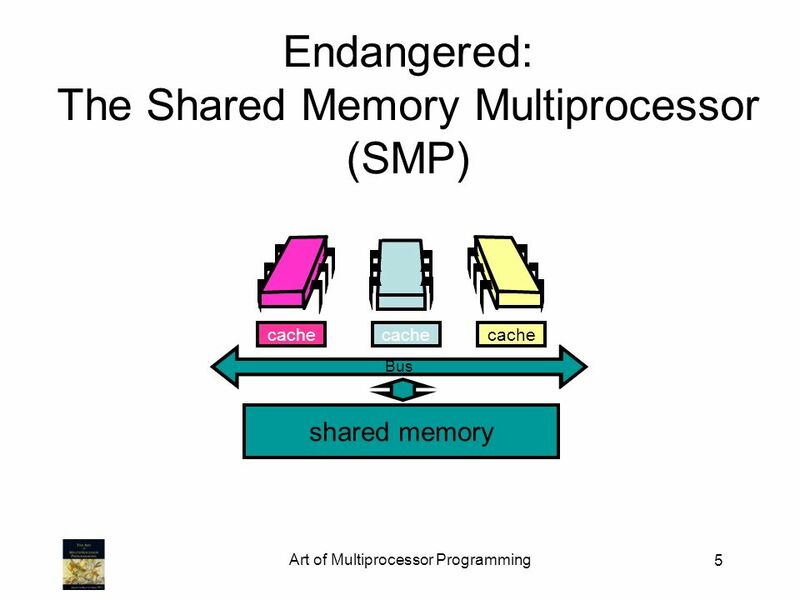 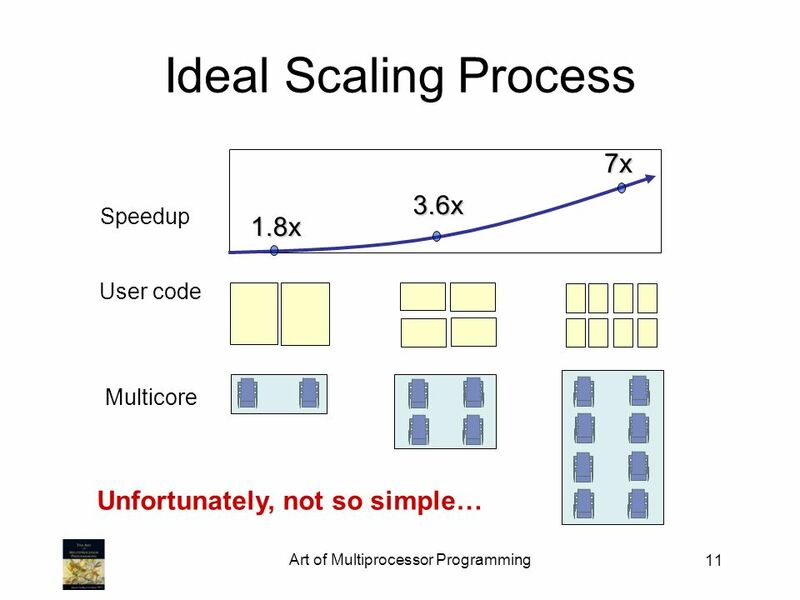 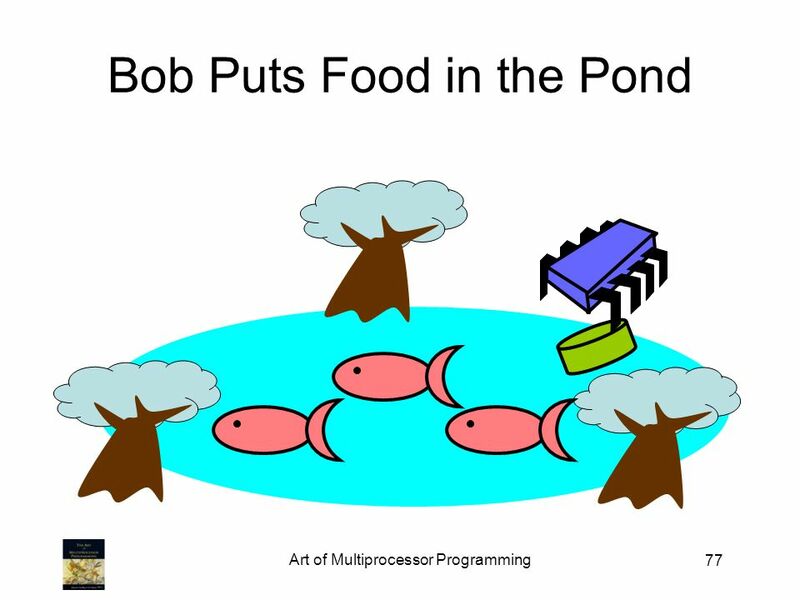 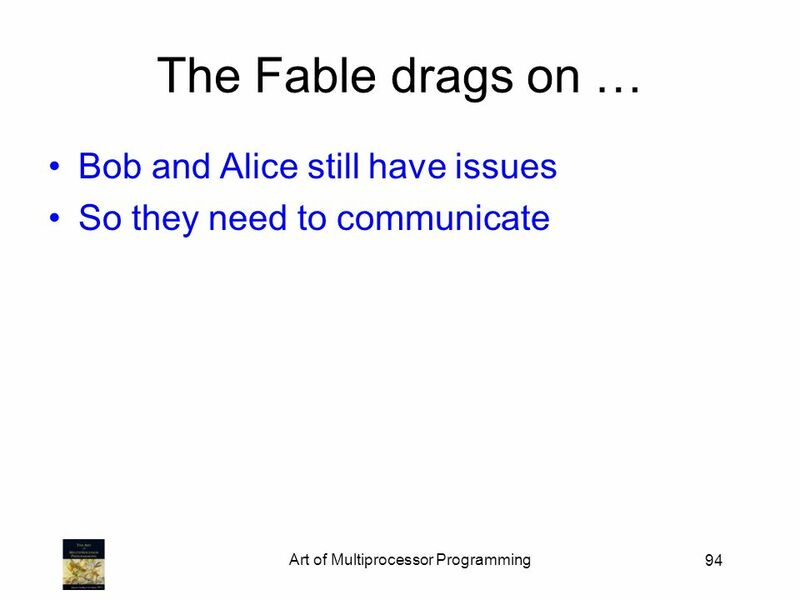 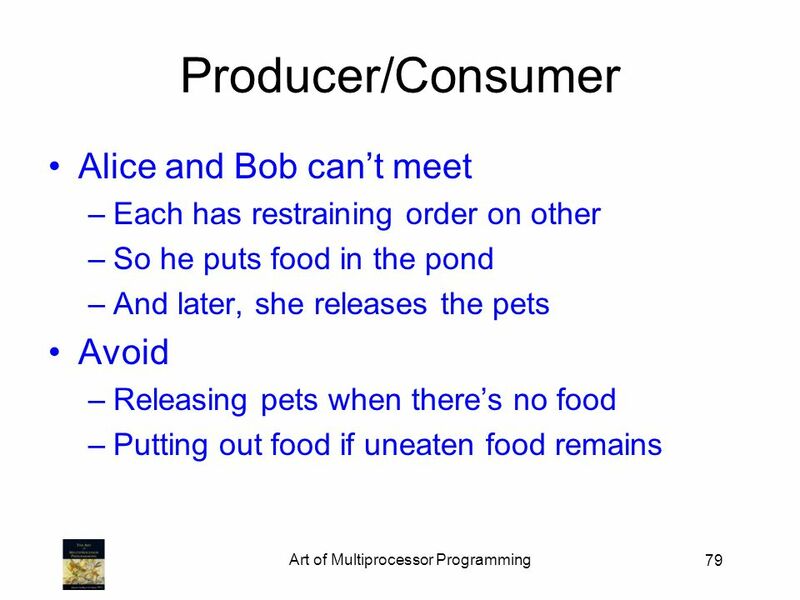 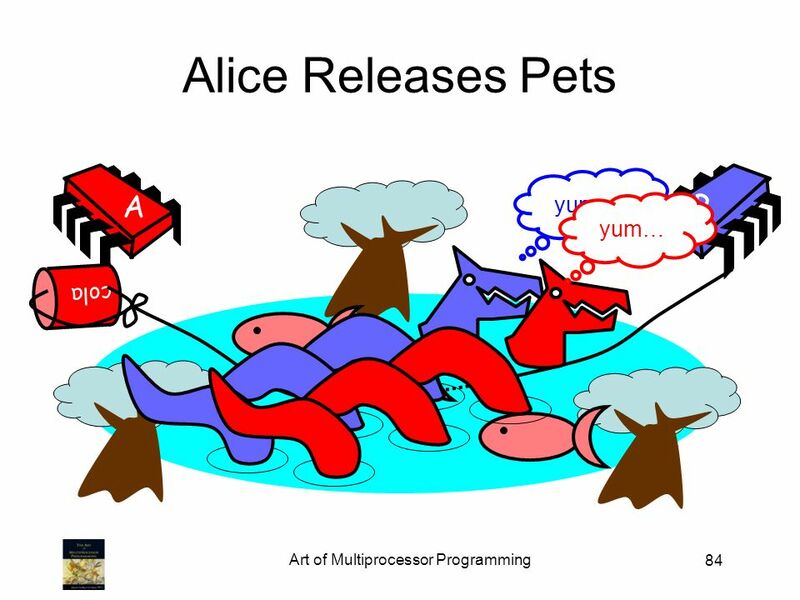 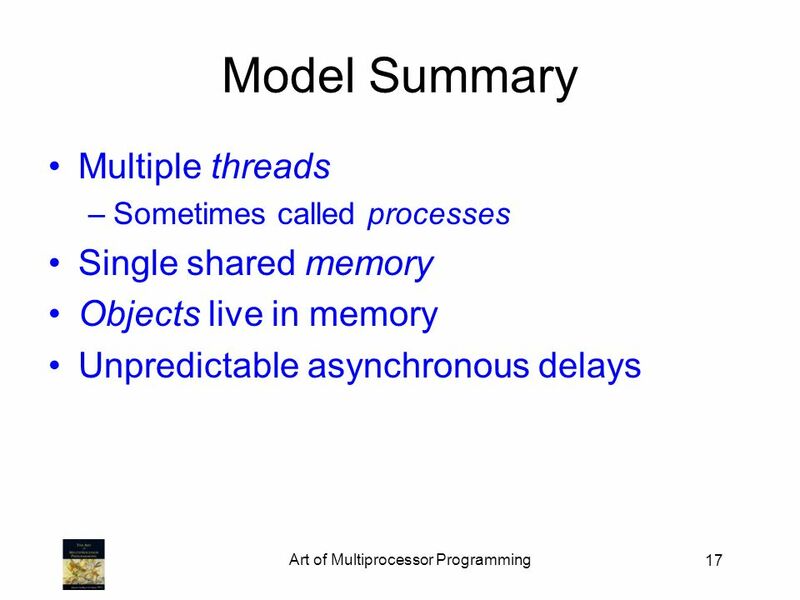 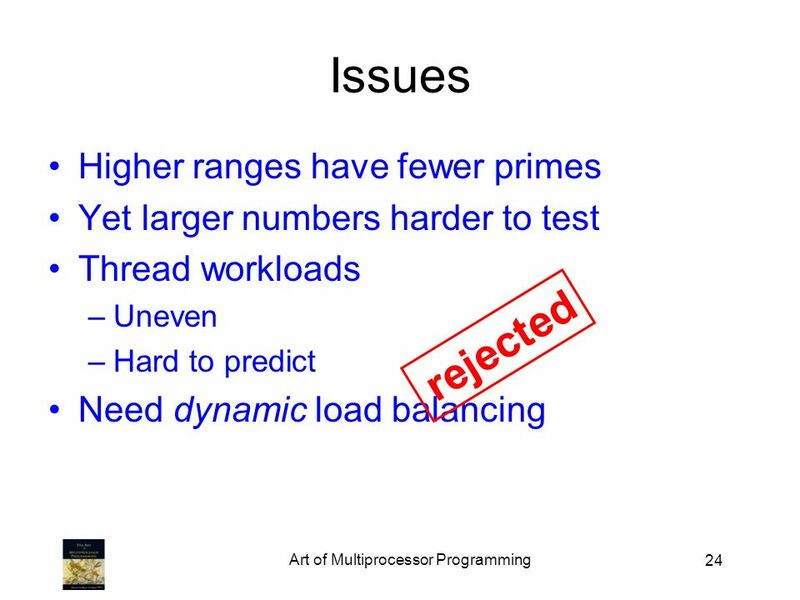 124 Art of Multiprocessor Programming Diminishing Returns This course is about the parts that are hard to make concurrent … but still have a big influence on speedup! 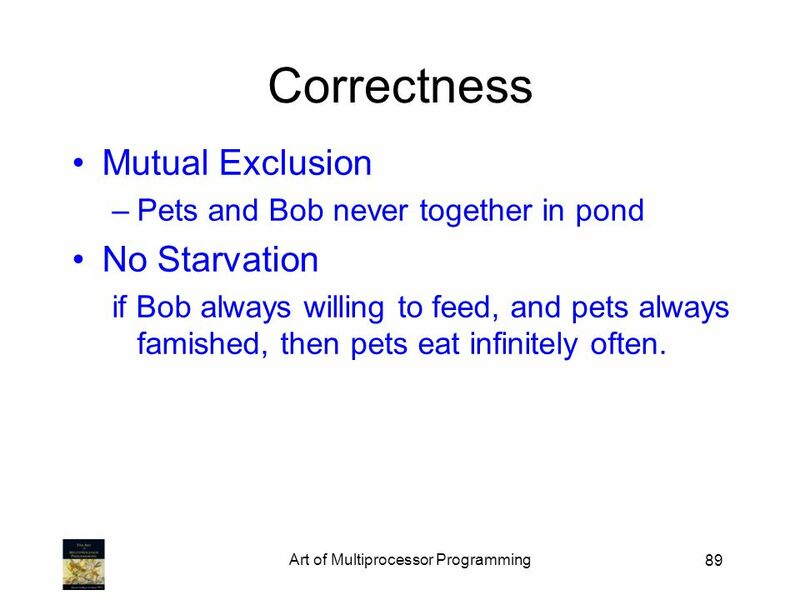 125 Art of Multiprocessor Programming 125 This work is licensed under a Creative Commons Attribution- ShareAlike 2.5 License.Creative Commons Attribution- ShareAlike 2.5 License You are free: –to Share to copy, distribute and transmit the work –to Remix to adapt the work Under the following conditions: –Attribution. 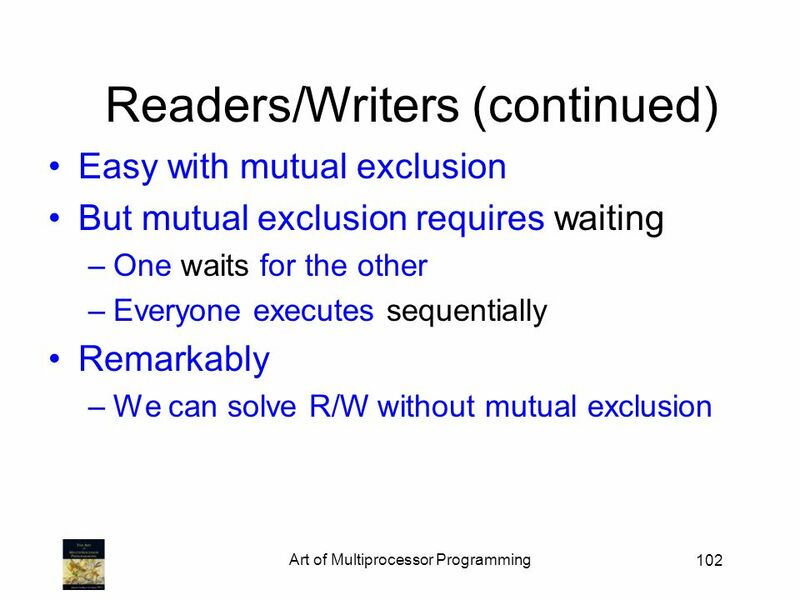 You must attribute the work to The Art of Multiprocessor Programming (but not in any way that suggests that the authors endorse you or your use of the work). 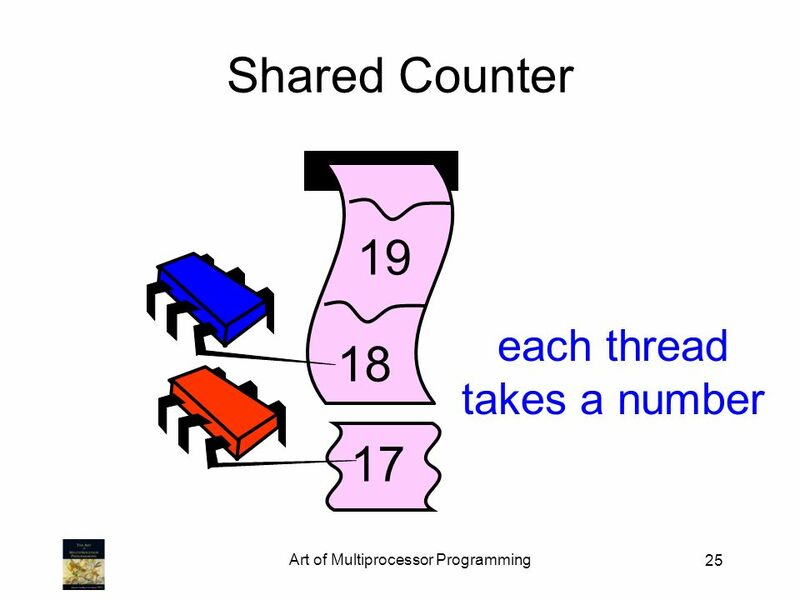 –Share Alike. 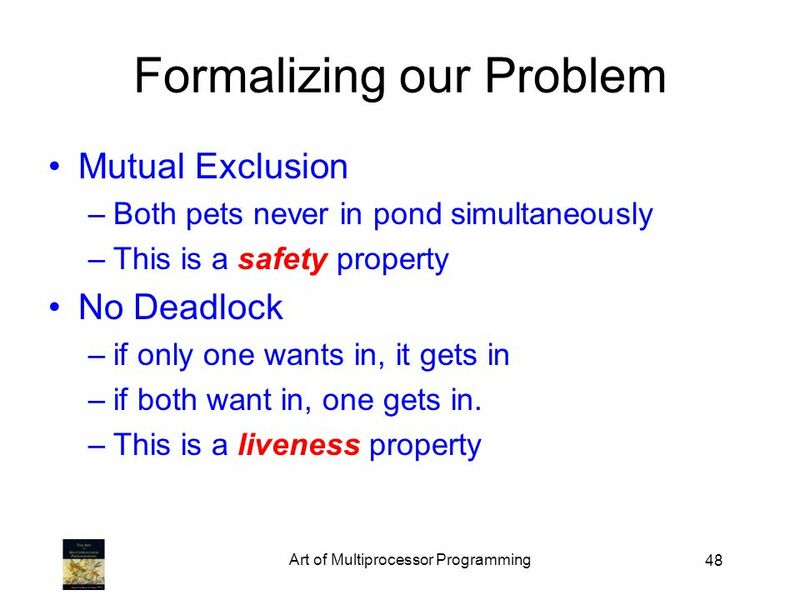 If you alter, transform, or build upon this work, you may distribute the resulting work only under the same, similar or a compatible license. 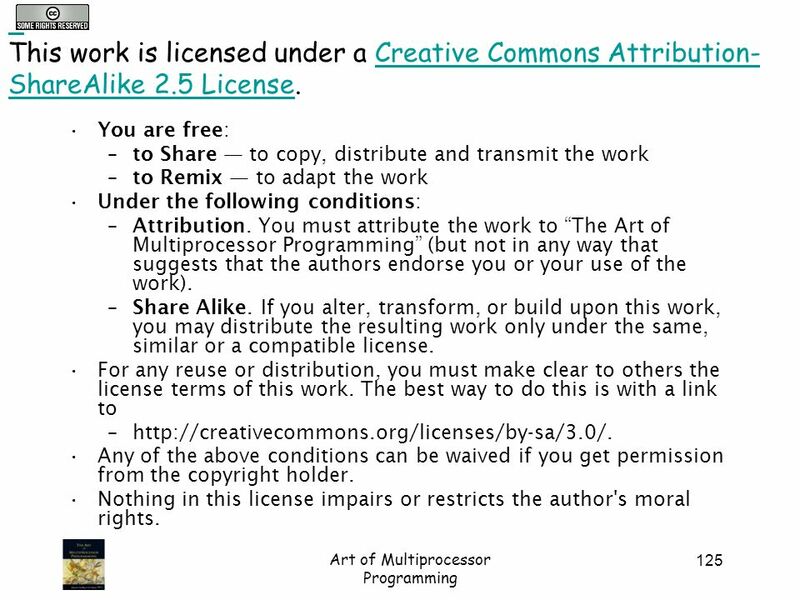 For any reuse or distribution, you must make clear to others the license terms of this work. 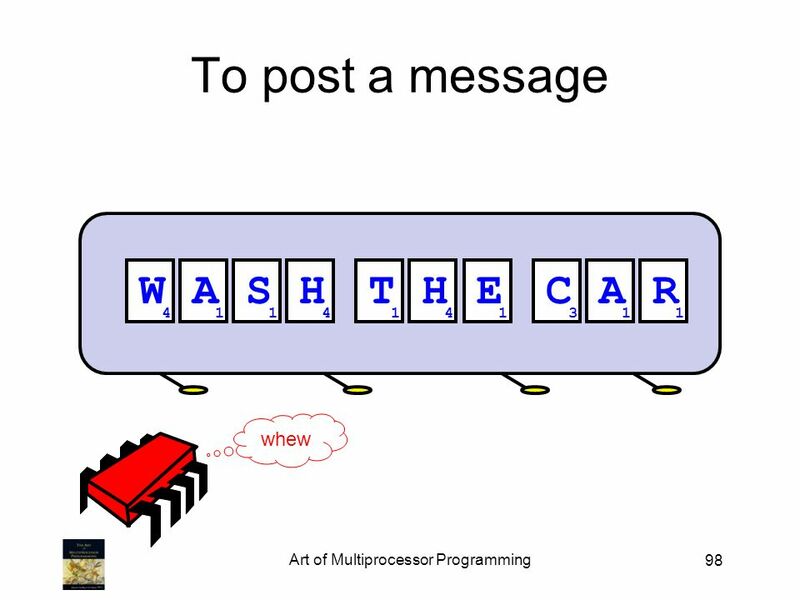 The best way to do this is with a link to –http://creativecommons.org/licenses/by-sa/3.0/. 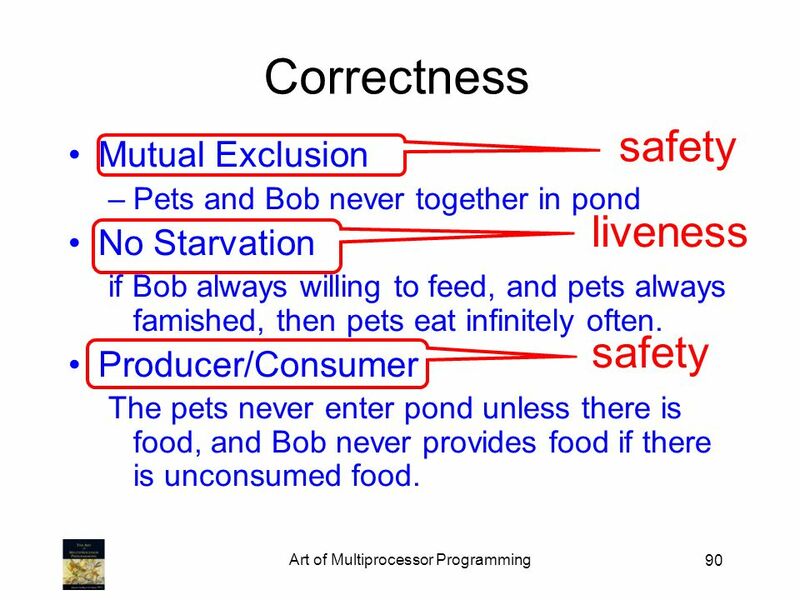 Any of the above conditions can be waived if you get permission from the copyright holder. 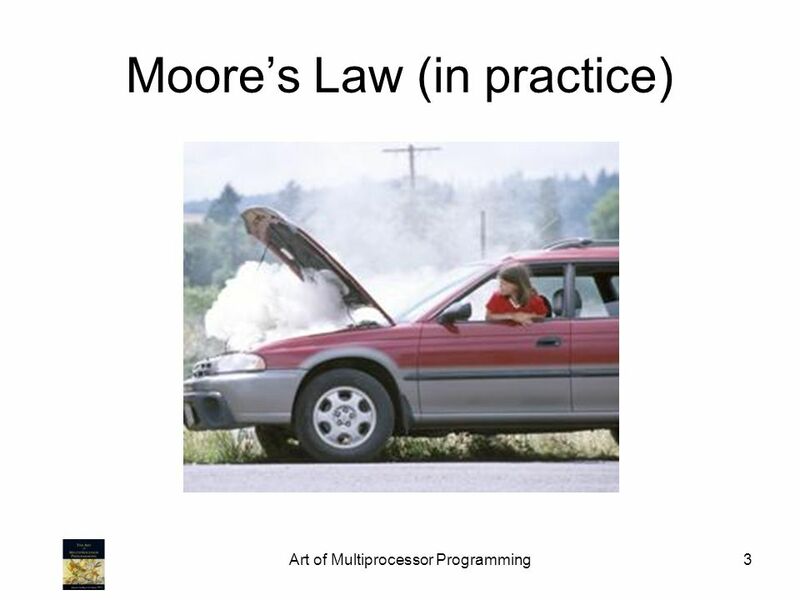 Nothing in this license impairs or restricts the author's moral rights. 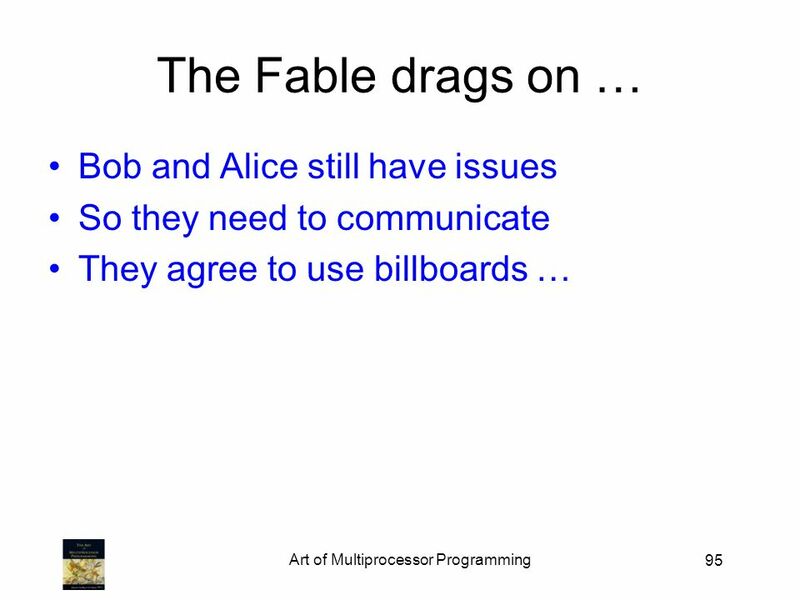 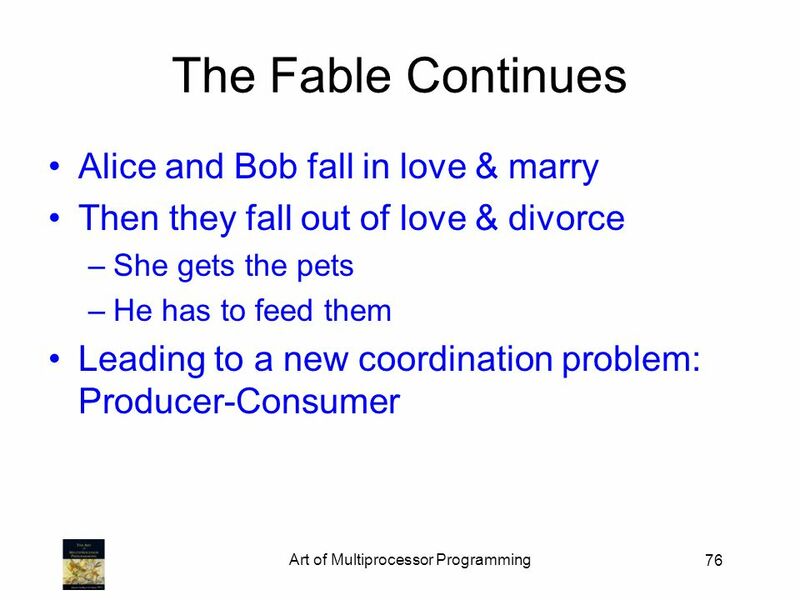 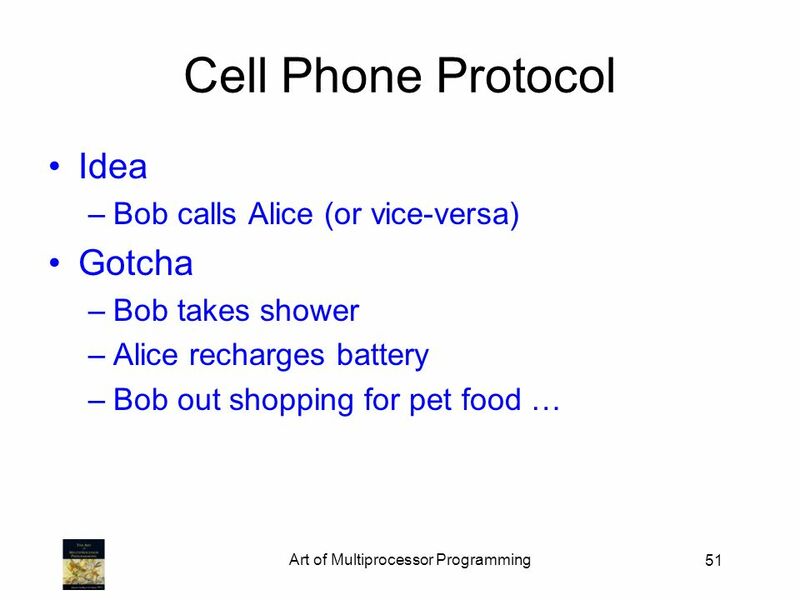 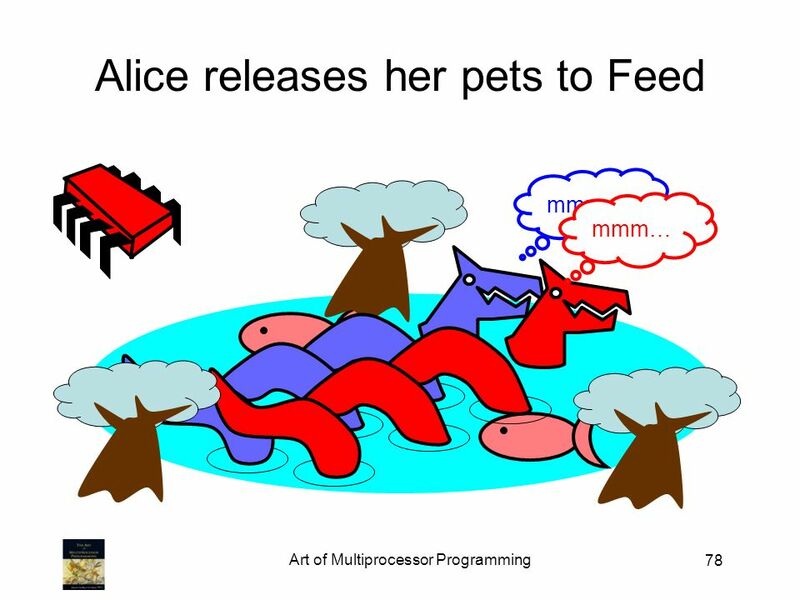 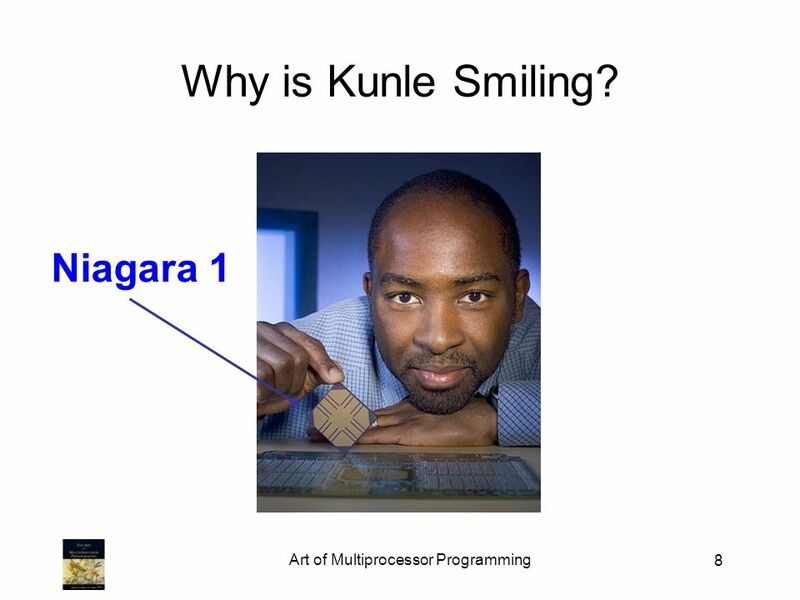 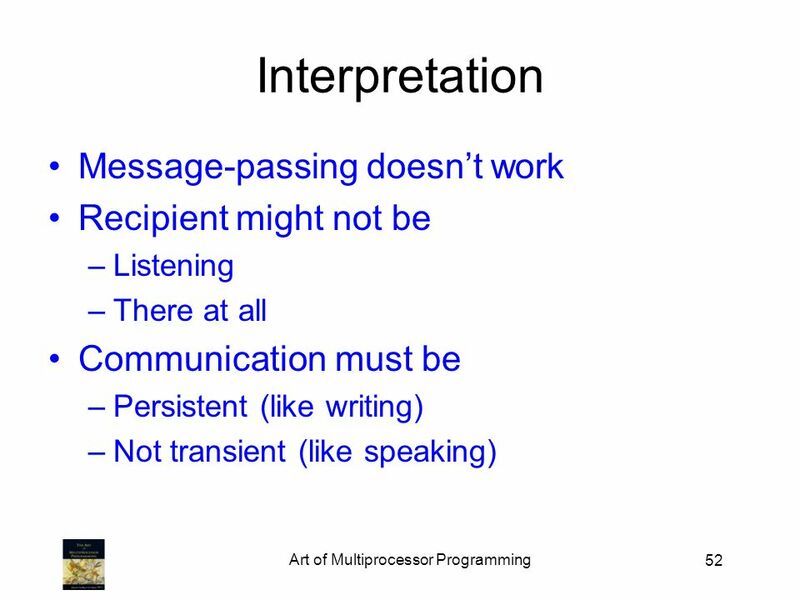 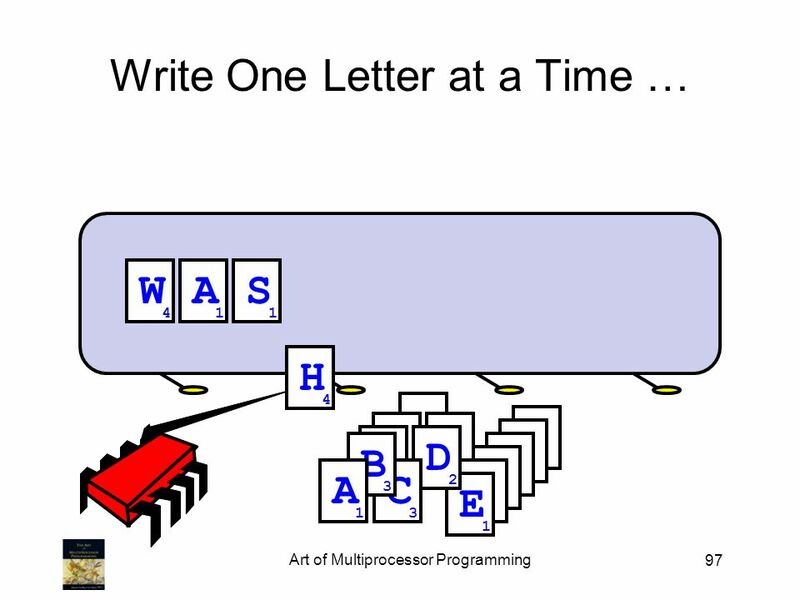 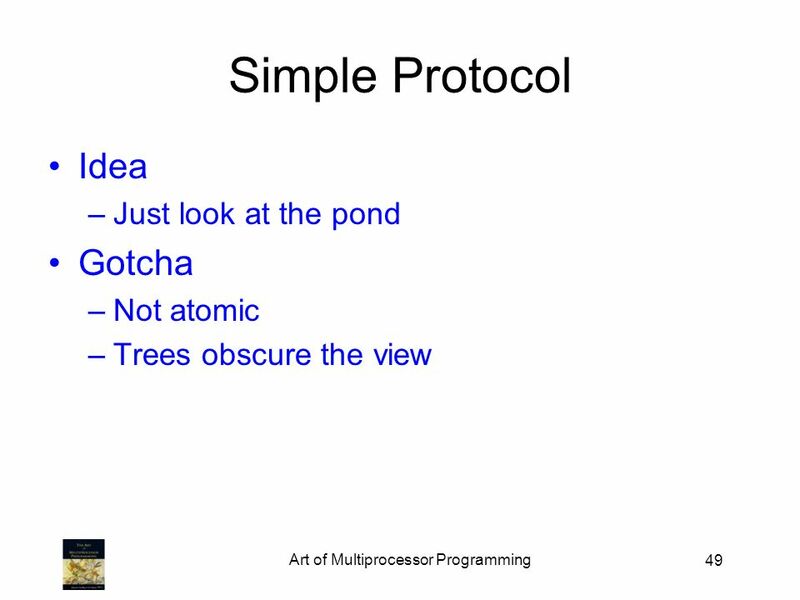 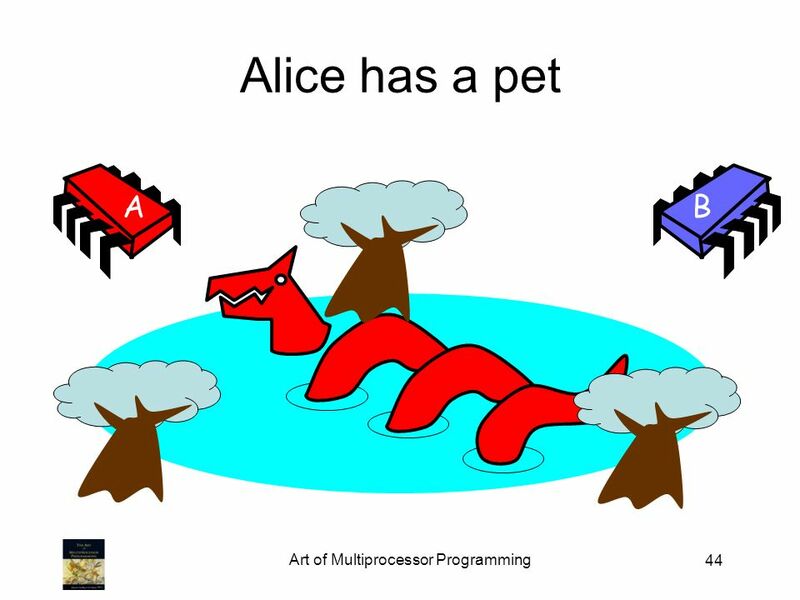 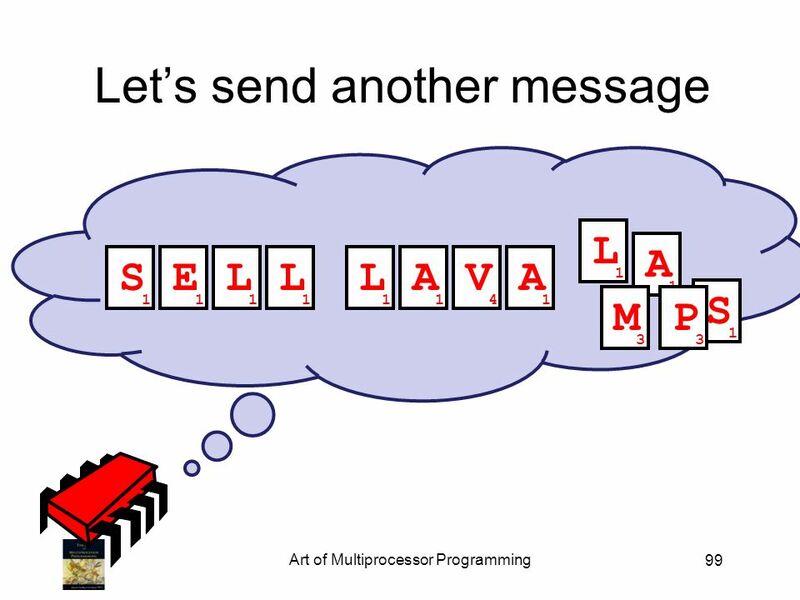 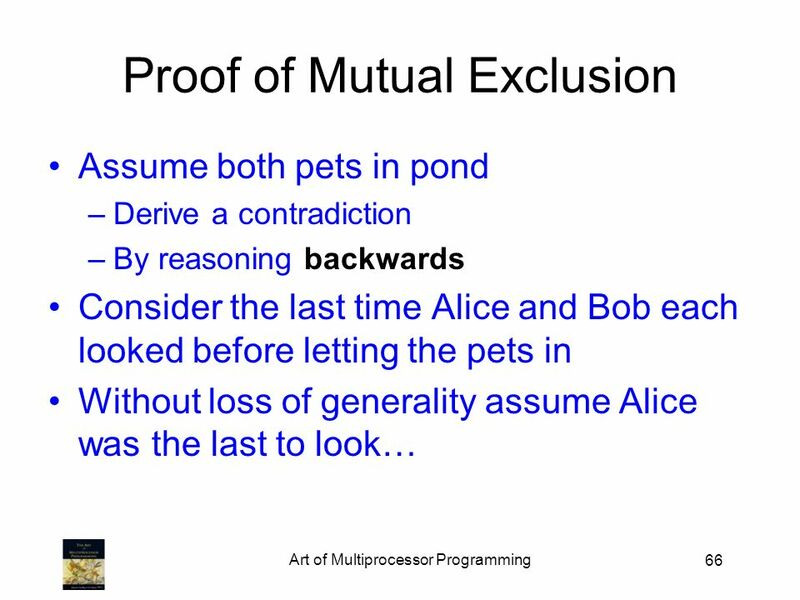 Download ppt "Introduction Companion slides for The Art of Multiprocessor Programming by Maurice Herlihy & Nir Shavit TexPoint fonts used in EMF. 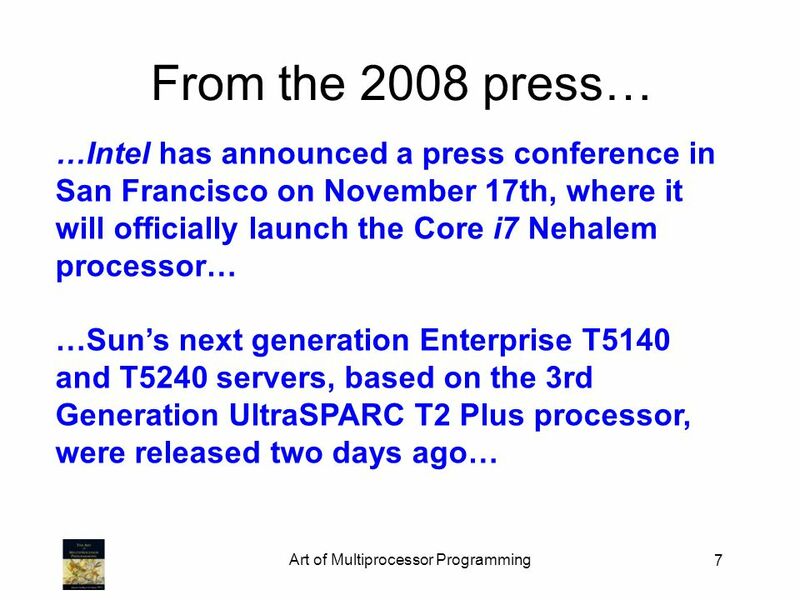 Read the TexPoint manual." 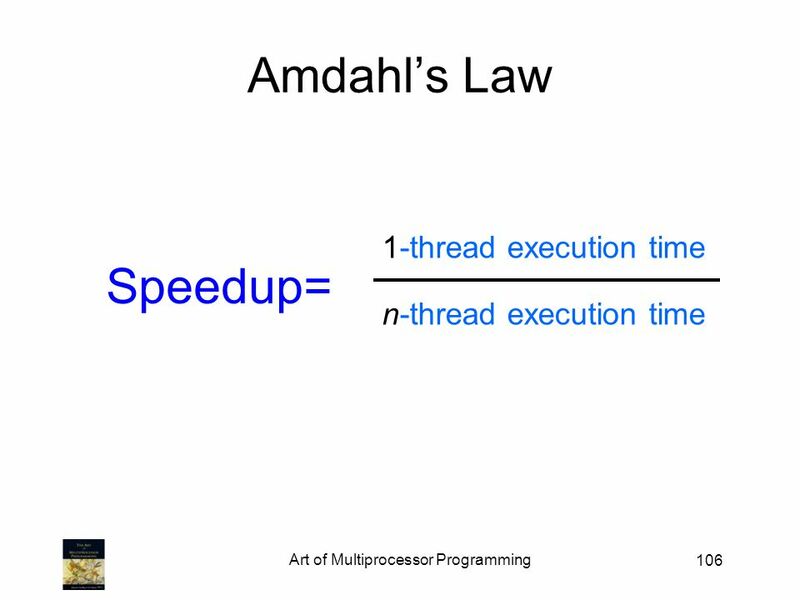 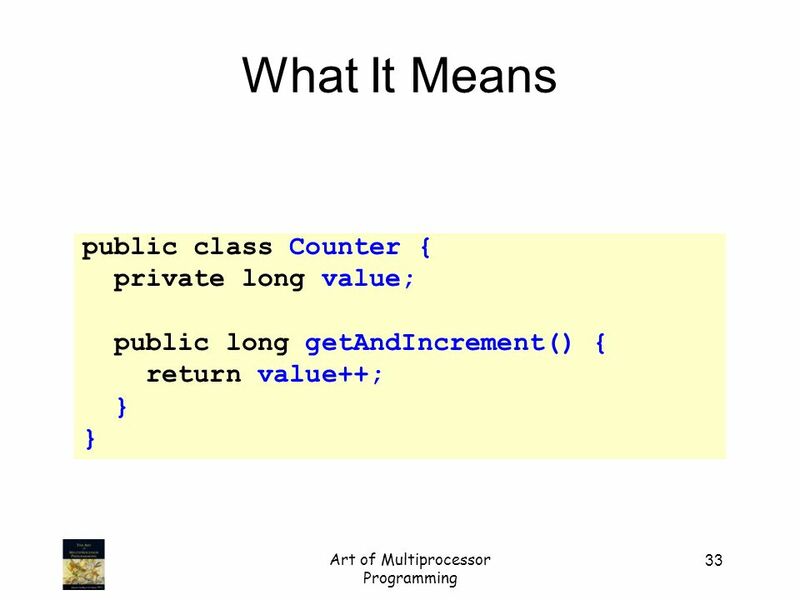 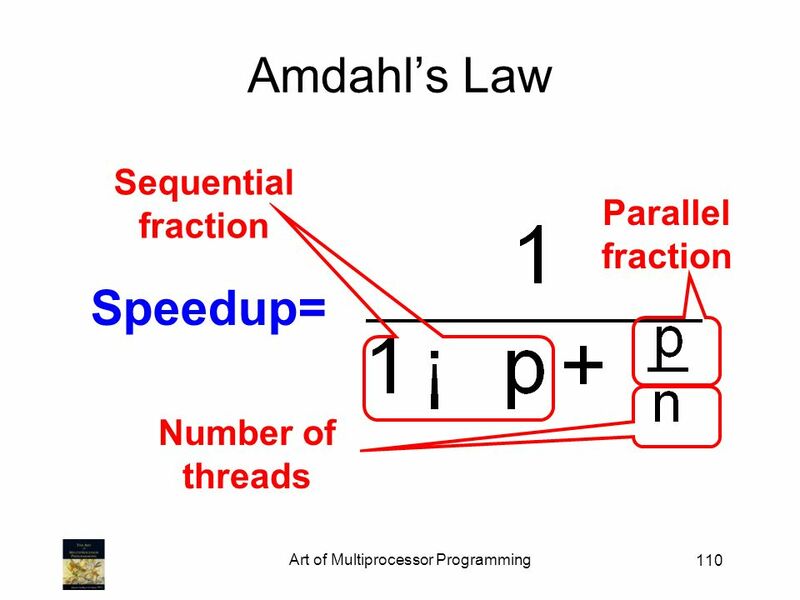 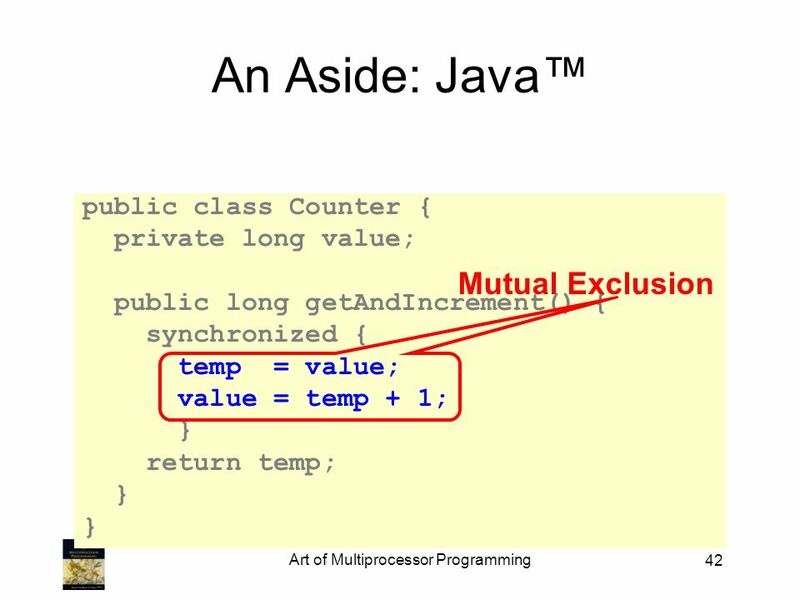 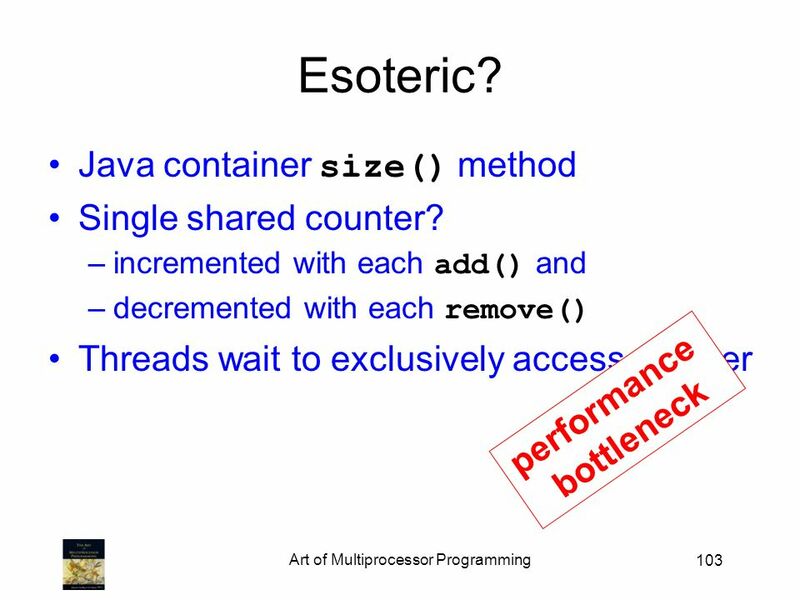 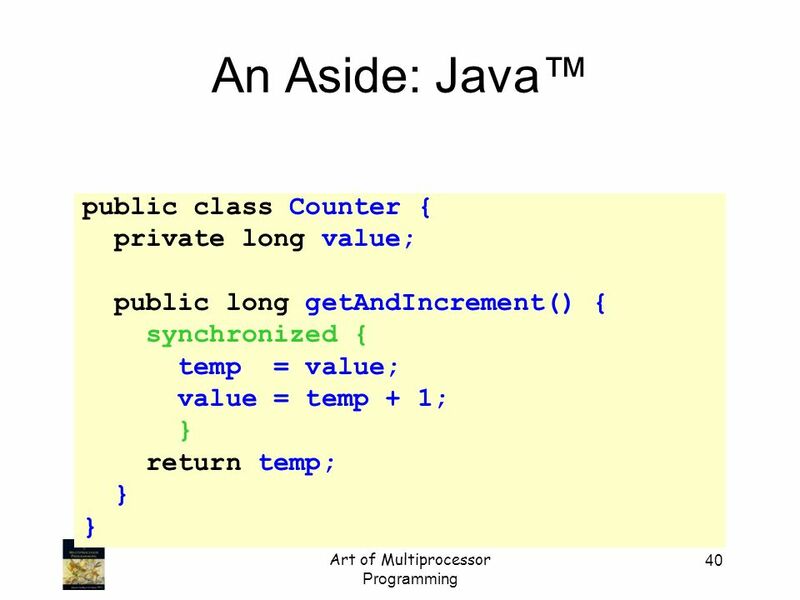 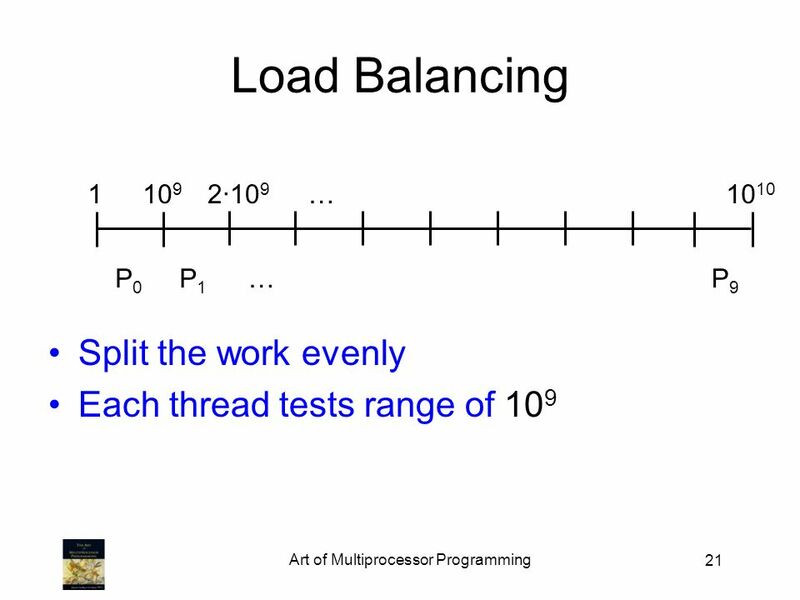 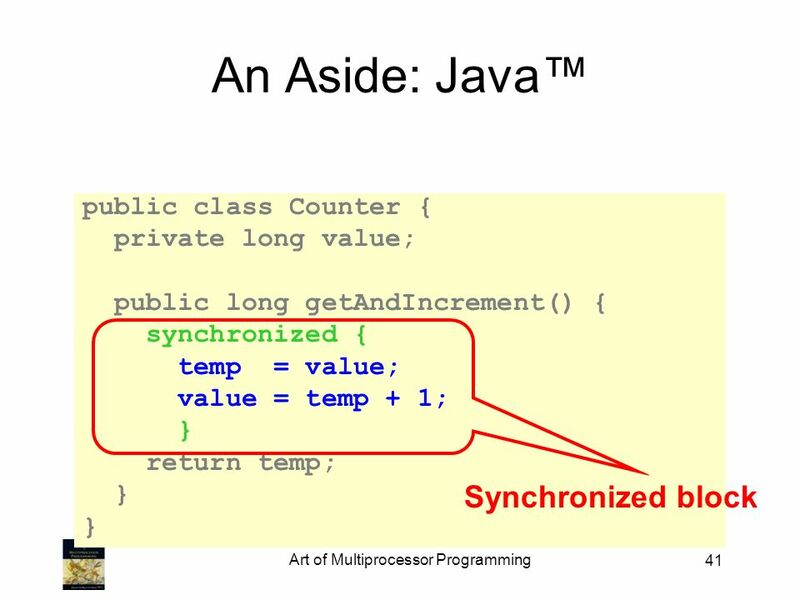 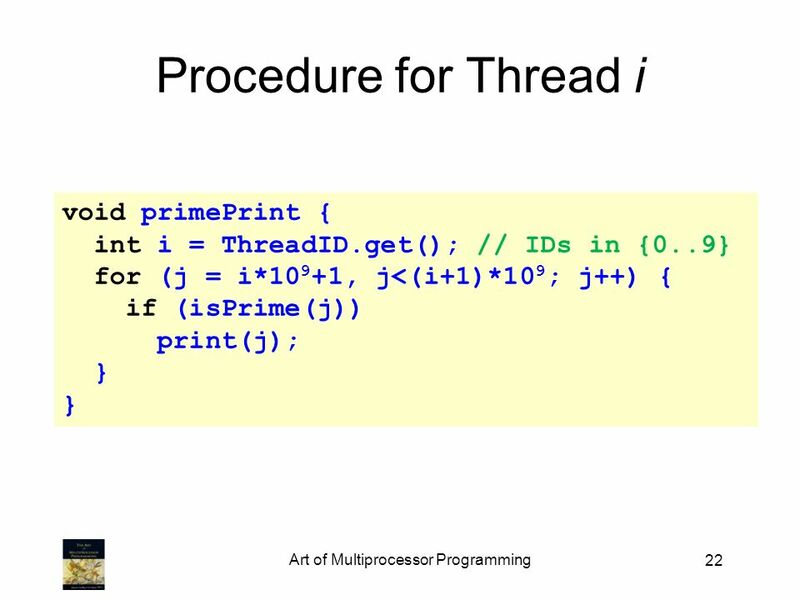 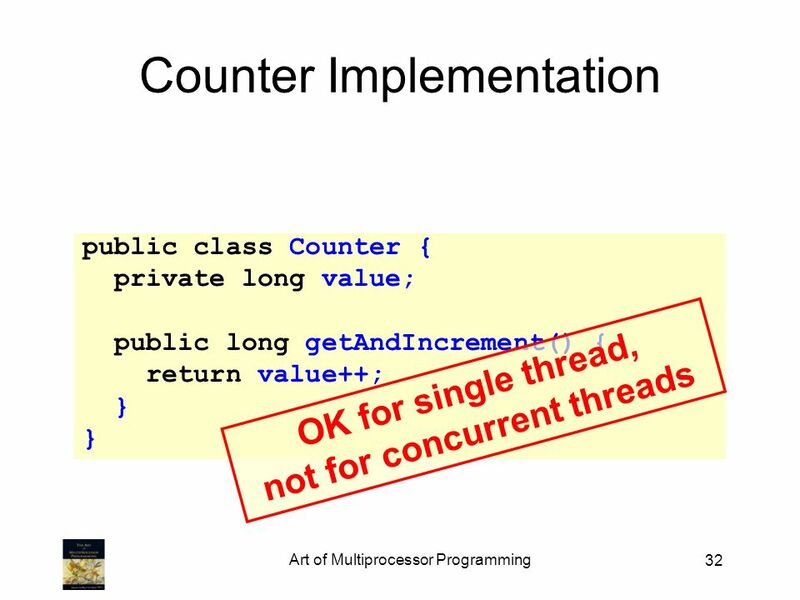 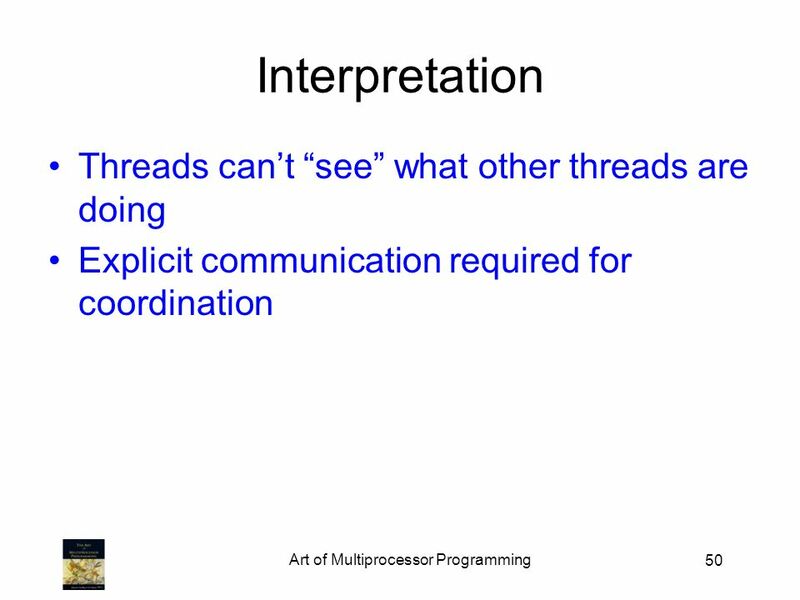 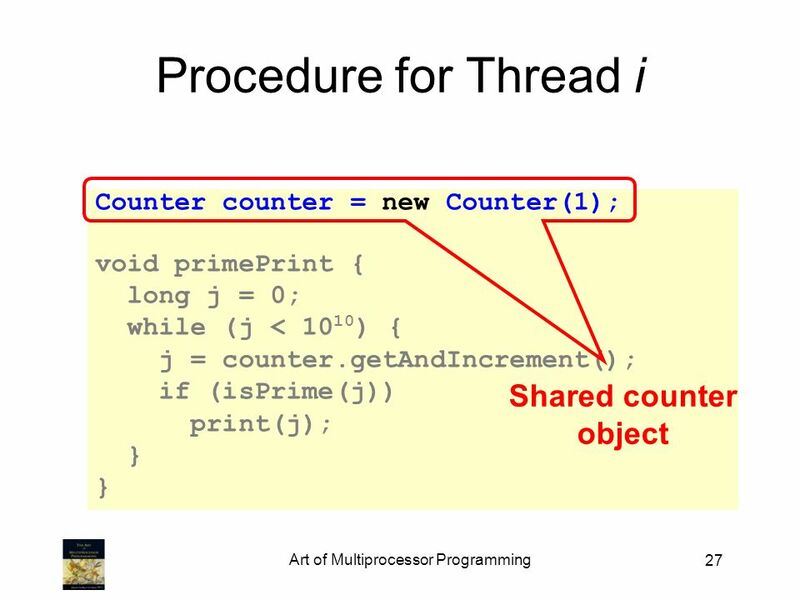 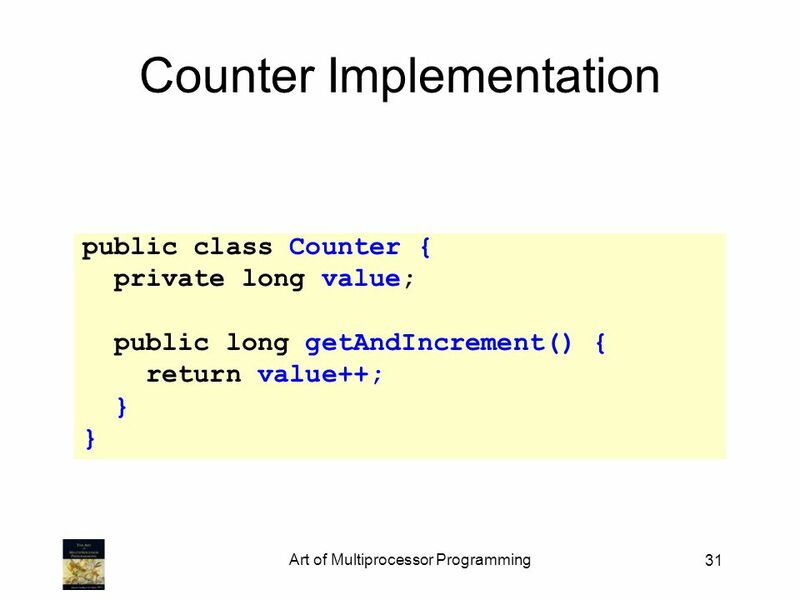 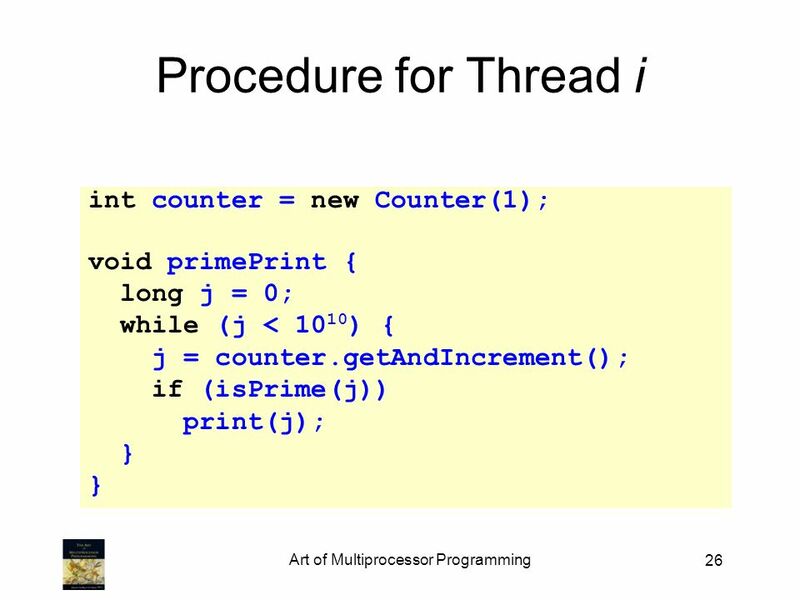 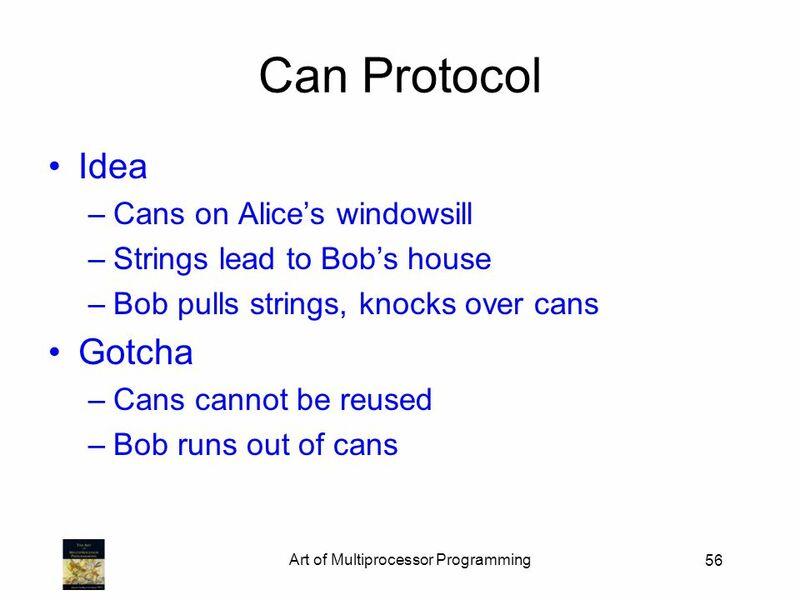 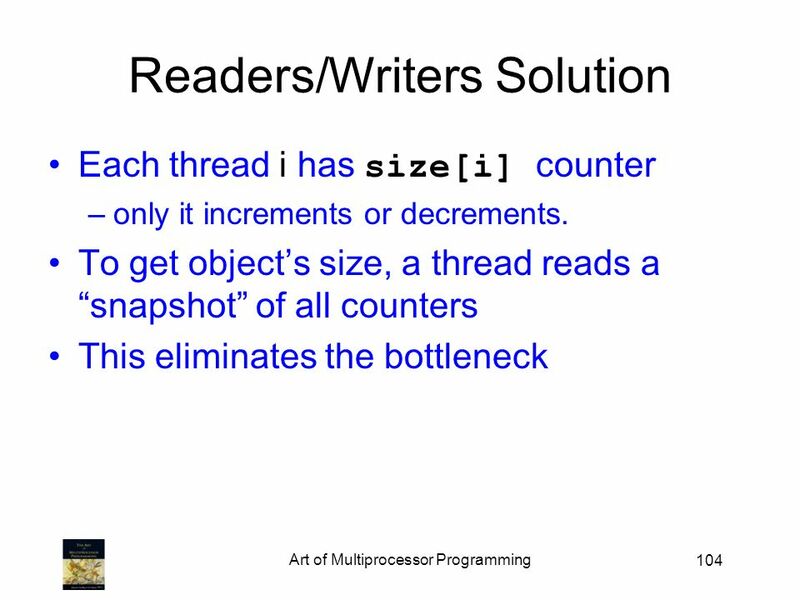 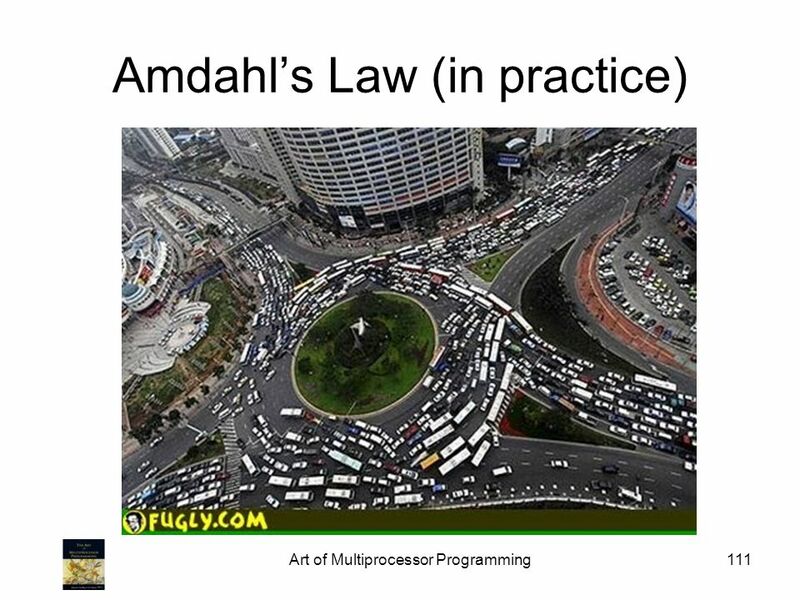 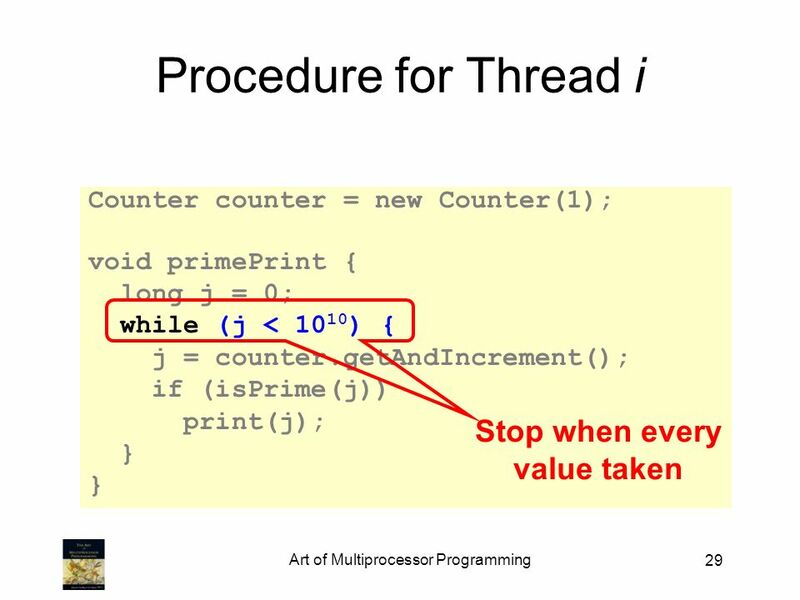 1 Multithreaded Programming in Java. 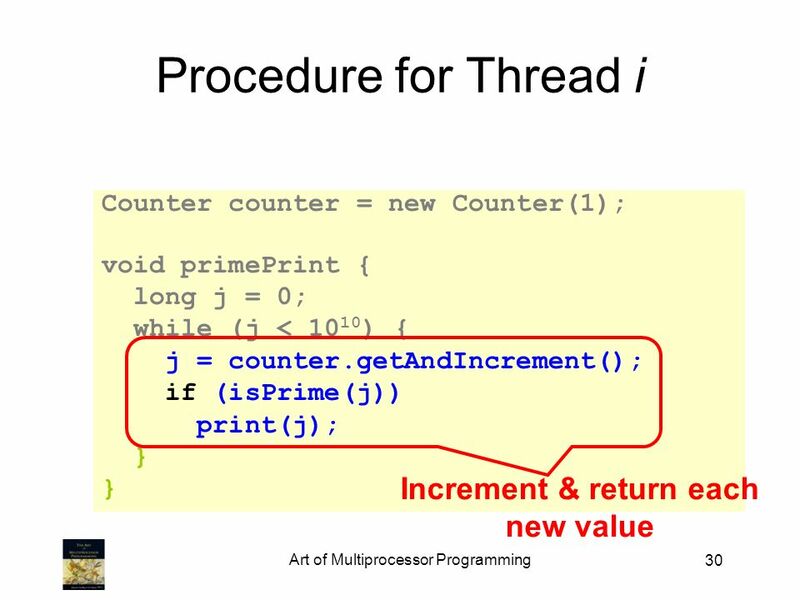 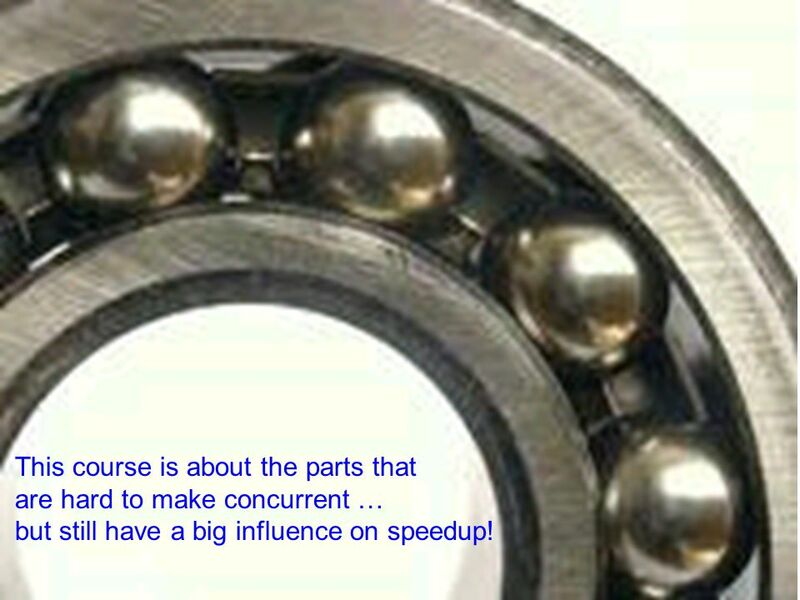 2 Agenda Introduction Thread Applications Defining Threads Java Threads and States Examples. 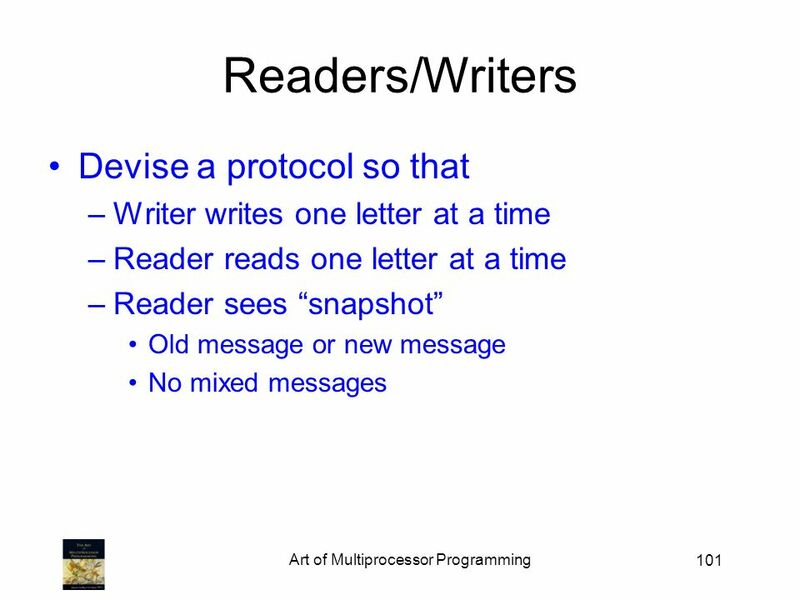 Chapter 1 Introduction Copyright © Operating Systems, by Dhananjay Dhamdhere Copyright © Introduction Abstract Views of an Operating System. 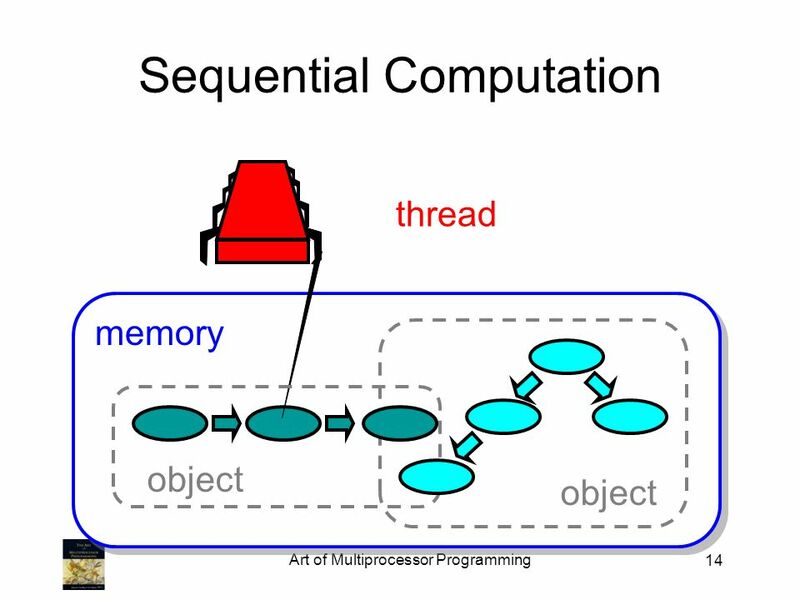 Dynamic Performance Tuning for Speculative Threads Yangchun Luo, Venkatesan Packirisamy, Nikhil Mungre, Ankit Tarkas, Wei-Chung Hsu, and Antonia Zhai Dept.